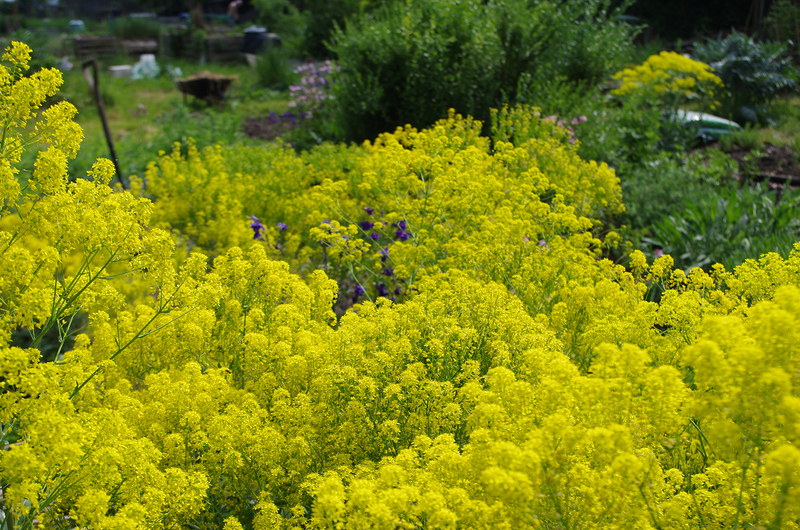 Woad (Isatis tinctoria) is a naturalised hardy biennial member of the Brassicaceae or cabbage family and was probably introduced into the UK from Europe. There are no close relatives in the UK but there is a similar plant from China called Chinese Woad (Isatis indigotica) which is primarily is grown as a medicinal plant but is also used as a source of indigo. Various web sources including Wikipedia assert that indigotica and tinctoria are botanically indistinguishable. 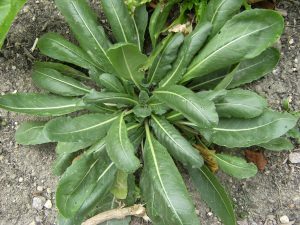 I have recently obtained some Chinese Woad seeds from a German company (Rühlemann’s) so intend to find out the truth of the matter next year. Woad will grow up to four feet high and here in Hertfordshire it flowers in May. 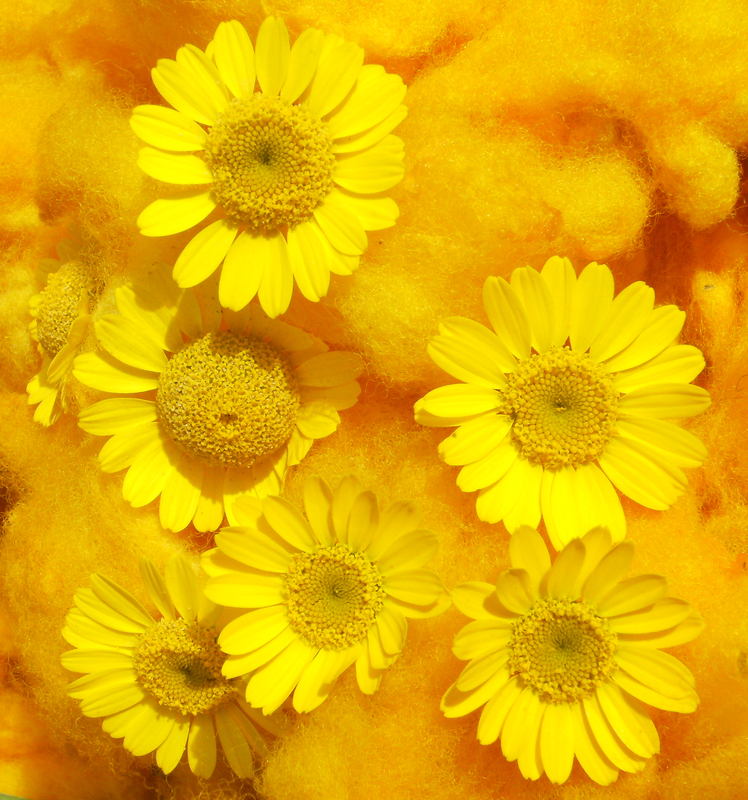 The flowers, like so many dye plants, are yellow and make a terrific show in spring. 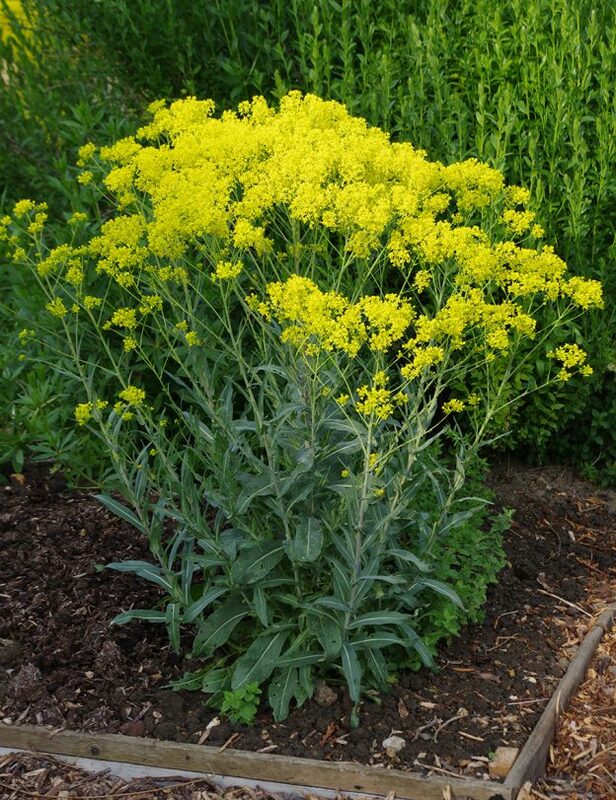 Unfortunately Woad is classified as a noxious weed in many western states of the US so if you live in one of these states please find out what the restrictions are before you even consider growing it. 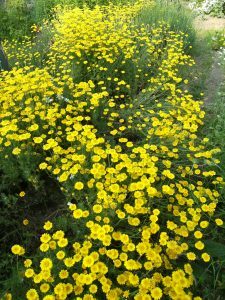 Here in the UK although it has naturalized and self seeds readily it is not invasive and only tends to grow in disturbed ground. Seeing it in the wild is a rarity. I have been reading about its invasiveness in the US and I now understand that it can invade wild areas of the West with ease probably because these areas are similar in habitat to its native eastern European and Asian plains. 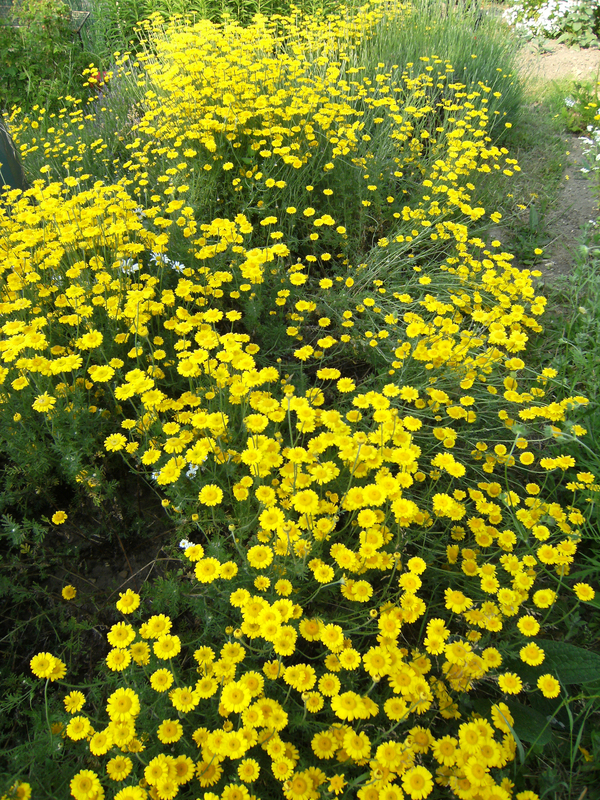 It is now classified as a noxious weed in the following states Arizona, California, Colorado, Idaho, Montana, Nevada, New Mexico, Oregon, Utah, Washington, and Wyoming. I have not found any reports of problems in the East of the US so would appreciate it if anyone who has any knowledge of this could let me know. Many thanks. More information can be obtained from this short online document here. For really comprehensive information see here. Woad generally produces masses of large seed “pods or cases” that are only viable for one year. These take a few months to mature and start falling or being blown to the ground by August. The seeds will then start to germinate as soon as the weather becomes wet (inhibitory chemicals in the seed case are washed away by rain). By late October/November new plants will have grown to a substantial size (big enough to harvest). Many seeds will not germinate until the following spring and a few of these will grow and flower in the same year. 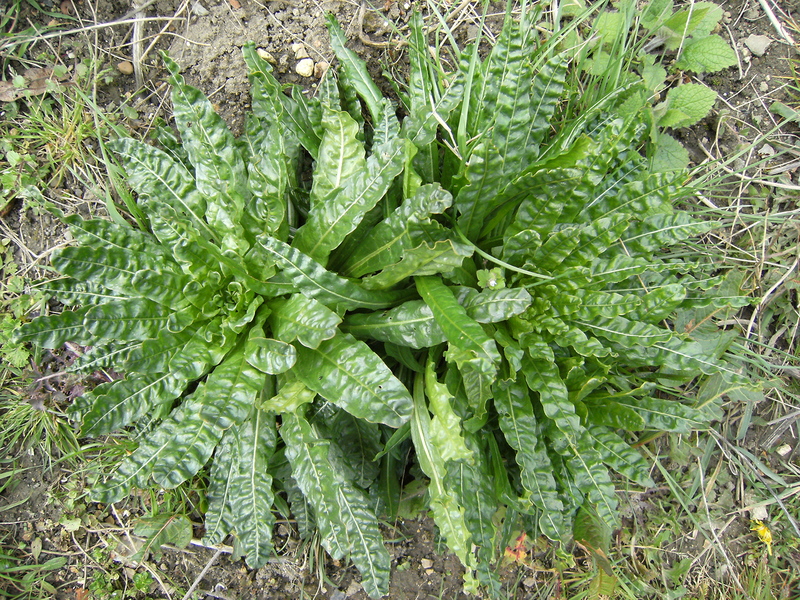 Those that do, will probably return to a rosette stage towards the end of summer which leads to the unusual sight of rosettes growing at the top of a long stem. Some second year plants will also survive flowering and also return to producing rosettes at the end of summer. These second year rosettes also produce indigo in the leaves. There appears to be a great deal of phenotypic variation between Woad plants. There are big differences in leaf colour ranging from blue/green to pale yellow/green and leaf shape from toothed to smooth-edged. 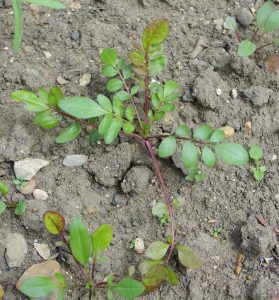 Because of this variability, Woad seedlings can be easily mistaken for weeds at first, especially if they have popped up in unexpected places. However, all Woad plants have a highly distinctive aroma, once smelt never forgotten! 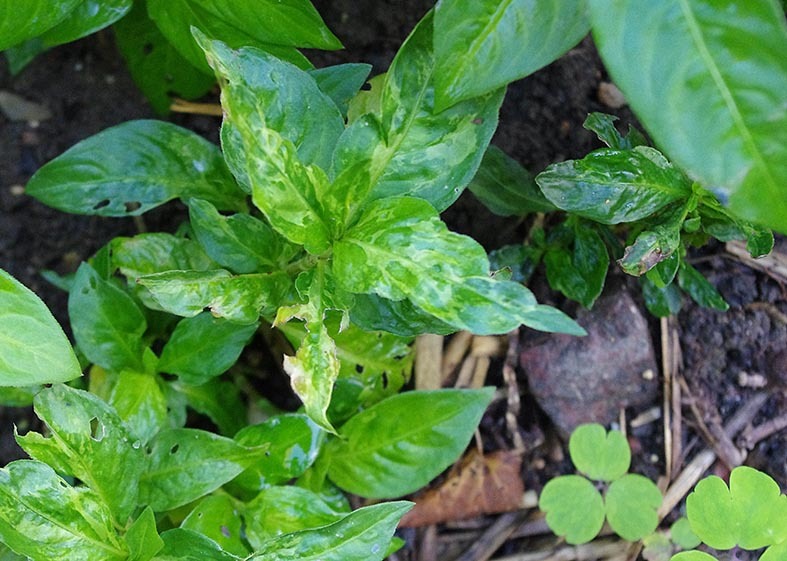 It seems likely that plants also differ in the amount of indigo they contain, so there is probably scope for plant breeders to improve the stock. 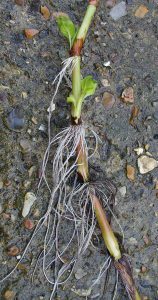 The long white tap root of a two to three month old young Woad seedling. 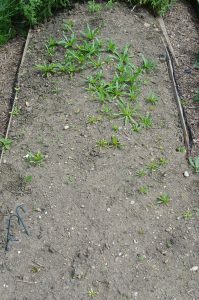 Directly sown Woad bed. Really this bed could have used some thinning out, but it demonstrates that a dense planting will crowd out weeds very effectively. Woad seeds are only viable for one year so make sure that your seed is fresh. If you buy commercially available seeds there will only be a few tens of seeds in the packet I don’t recommend that you risk them by sowing direct. Sow well away from slugs and snails indoors or outdoors in early April. There is no need to heat the trays. Each winged seed case actually contains more than one seed and so can produce more than one seedling. The plants will grow quickly. Plant them out on a warm day in early May. There’s no need to wait until the last frost as they are hardy. I have only ever needed to buy Woad seeds once. The plants produce thousands of seeds which will spread around the garden and germinate in mid to late summer. I collect a carrier bag full on a dry sunny day in late summer when the seeds have fully matured. They store well if kept dry. 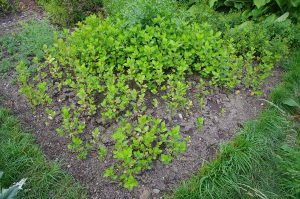 I sow them liberally onto a prepared bed the following April, where they germinate readily and then may need thinning out. At the beginning, to avoid having to buy the seeds two years running, keep a few seeds to plant in October. 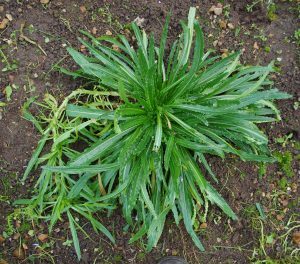 Depending on conditions, if you are lucky some of these late sown plants will stay in the rosette stage long enough to providing a useful crop for dyeing in the summer of your second year. 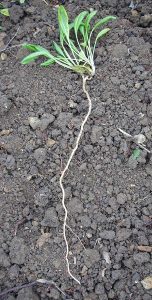 The young seedlings produce long tap roots that can penetrate deep into the ground, so the plants rarely suffer from drought. However watering regularly will encourage growth. The larger the plants the more water they need. 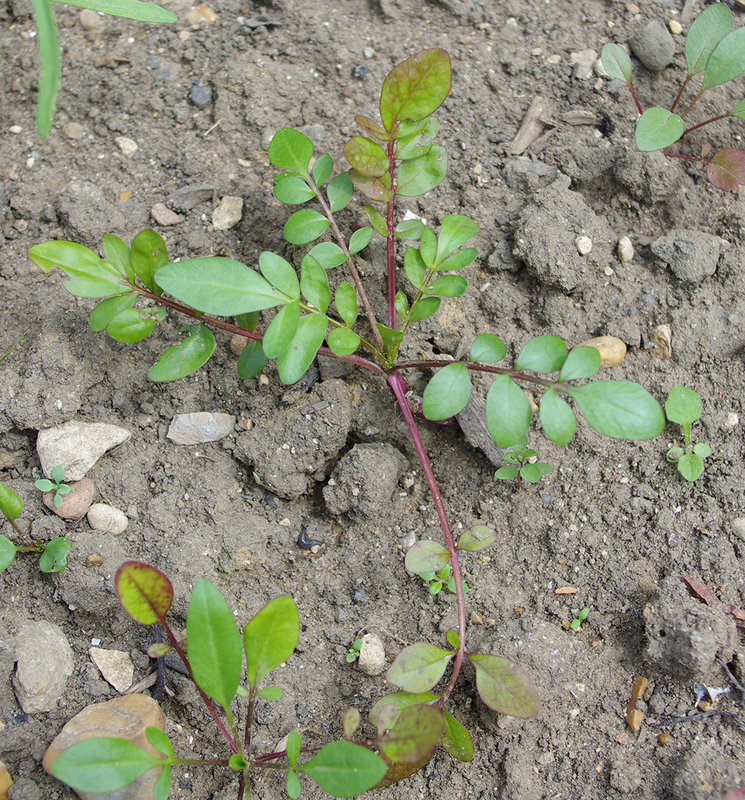 Woad, like Japanese Indigo needs copious quantities of fertiliser to get a good crop. Animal manure is excellent if you can get it. This is best dug into the top few inches of soil before sowing or planting out and will last the whole season. 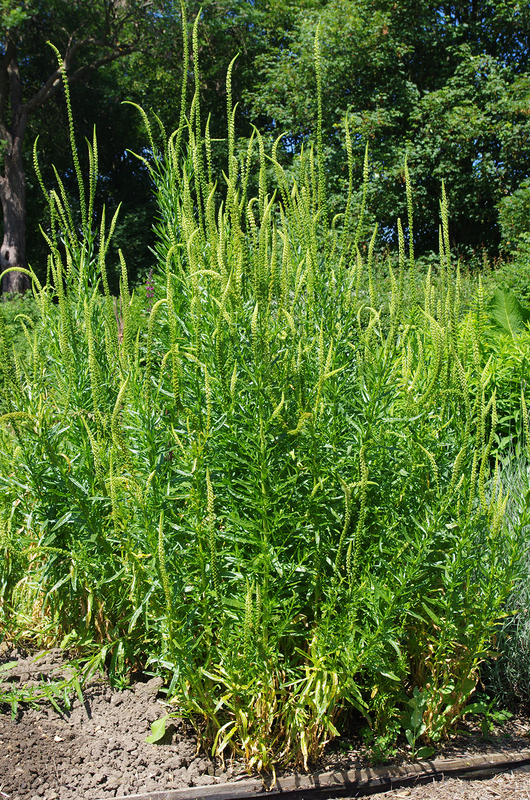 Woad generally does not suffer from many pests and only a few diseases. As a cabbage family plant it may suffer from club root when grown in acid soils, but I have not heard any reports to that effect. It occasionally attracts cabbage white butterfly and flea beetle but the damage to leaves is seldom serious. When grown densely it does attract the attention of a few species of slug and snail but again these do not threaten the plant’s success so there is little need to take protective action. For more on pests see here. The amount of indigo in Woad leaves varies according to the weather and the plant’s developmental stage. 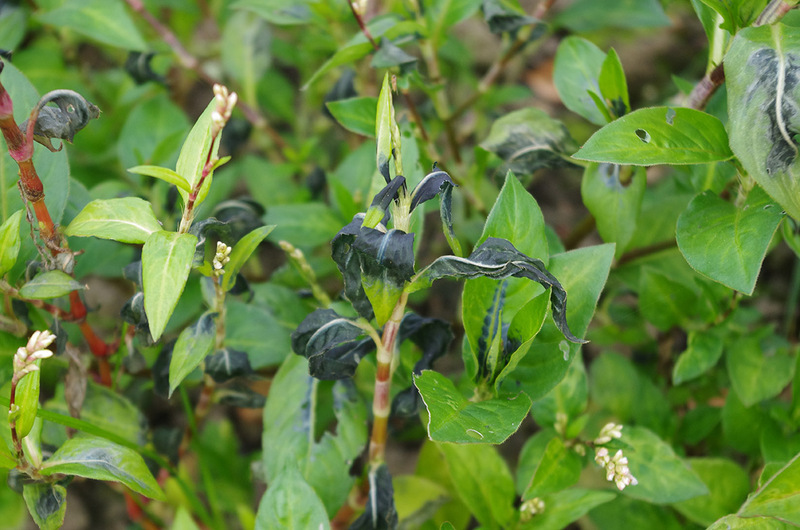 The plant produces more indigo when the weather is hot and sunny but once the plant has started to produce flower stems in early Spring the amount of indigo in the leaves rapidly diminishes, falling to zero when the plant is in full flower. For this reason Woad is invariably harvested in the summer of its first year while still in a rosette stage. The leaves at this stage are thick, fleshy and give off Woad’s characteristic smell when bruised. The smell is not pleasant but it has such good associations for me that now I have come love it. It is sometimes possible to trick the plants into returning to their rosette stage by cutting the flower stalks before the seeds form. Once harvested, the leaves need to be used the same day. When Woad was grown commercially in the UK the leaves were crushed in a mill and the resulting mass shaped into balls which were then set aside to dry. Woad stored in this way loses some of its indigo. The Woad Centre This is a web site by Ian Howard from Woad Inc the UK’s only commercial grower and processor of indigo from Woad. Bleu de Lectoure A Toulouse based company which also grows and produces indigo from Woad. 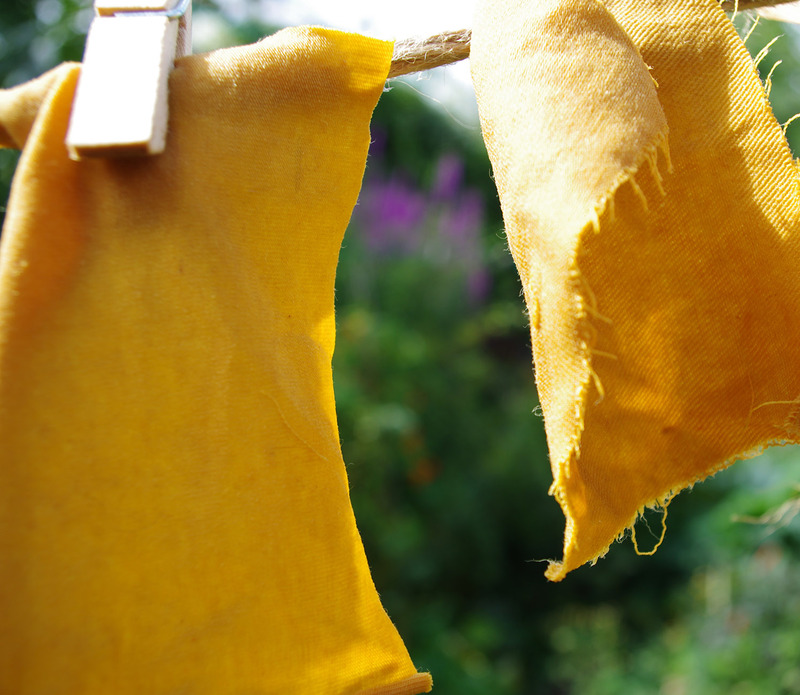 This entry was posted in Ashley's posts, growing dye plants, Growing Woad, woad and tagged Grand teint, Growing dye plants, Indigo, Indigo dye, Isatis tinctoria, Natural dyeing, Woad on 2nd December 2016 by susan dye. Dyer’s Chamomile or Golden Marguerite (Cota tinctoria also known as Anthemis tinctoria) is described as a hardy but weak perennial because it usually dies in the late summer of its second year. 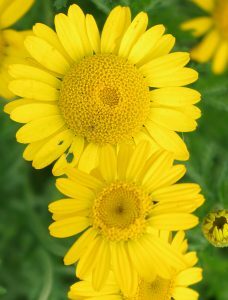 It is a sprawling daisy-type plant, growing from one to two feet high. The leaves are feathery and often look blue-green. It originates from Southern, Eastern and Central Europe. The fragrant flowers last a long time (two to three weeks) and are not bleached by direct sunlight. Incidentally this is a good way of assessing just how light fast the dye from flowers can be. 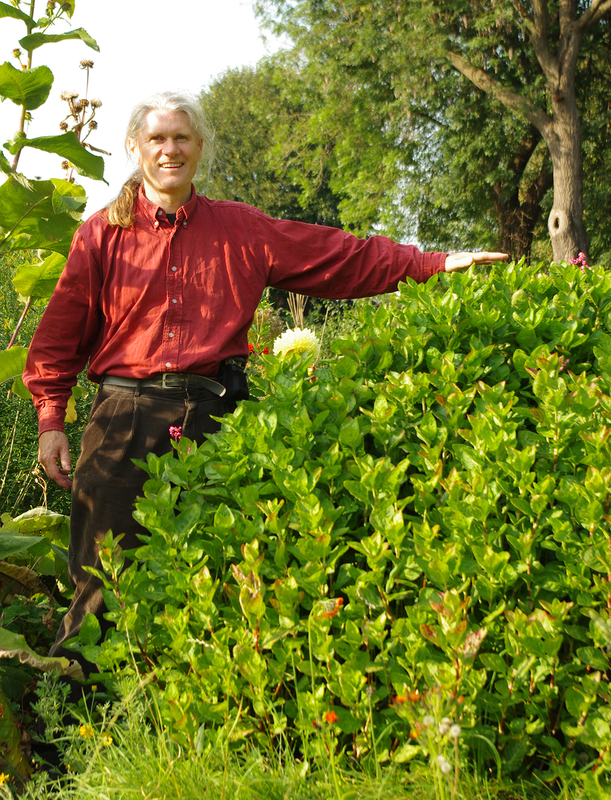 There are numerous sub-species, hybrids and garden varieties e.g. 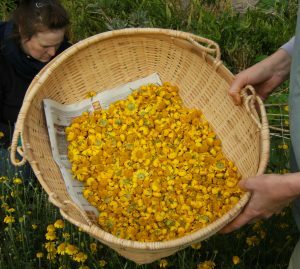 I have only grown the unnamed variety of Dyer’s Chamomile (sourced over 8 years ago from Suffolk Herbs, now King’s Seeds), so I cannot comment on the quantity or quality of dyestuff produced by these named varieties. This is an experiment waiting to be done! My guess is that probably all produce some dye and that “Kelwayii” may be the best for the dye garden as it has completely yellow, large flowers and will self-seed if the conditions are right. I usually grow Dyer’s Chamomile from seed which I saved from the previous year’s flowers. Its seeds have a good shelf life of three or more years if kept in dry cool storage. 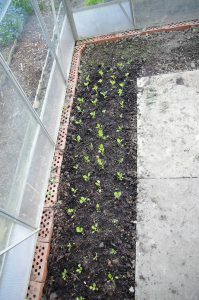 The small seeds should be sown thinly in seed trays from early April. They germinate easily and can be planted out when large enough to handle. The plants are hardy so can be planted before the last frost. Cuttings can be taken and will root readily – indeed this is the only way to propagate the hybrid varieties. If you have excess seedlings don’t discard them. 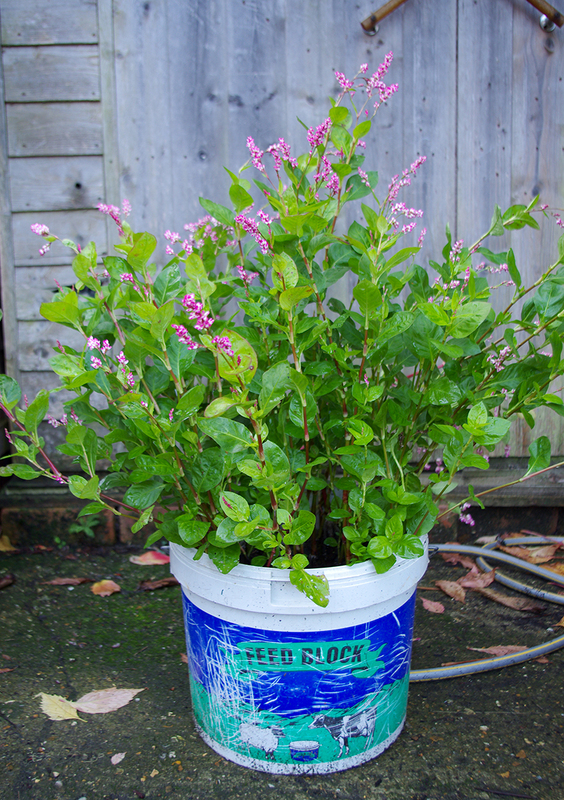 If regularly watered, they can be kept for at least a year without flowering. Restricting their roots arrests their development but does not prevent them from springing into action when planted out. 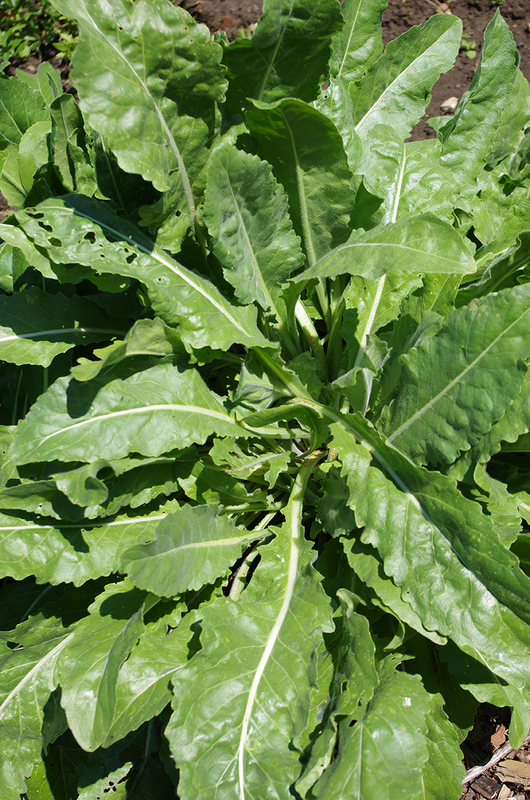 There are few plants that can be mistreated in this way, but chard is another plant with the same properties. 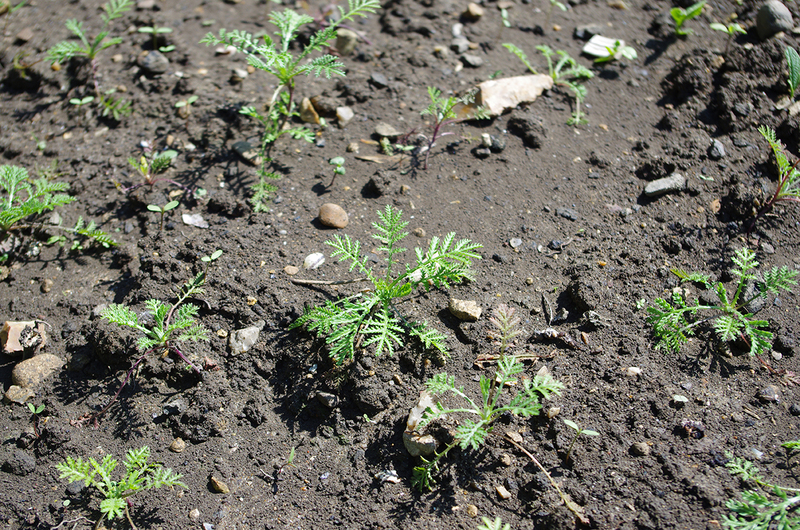 Dyer’s Chamomile will also self-seed but the tiny seedlings usually get eaten by slugs. After growing the plant for several years now, I notice there are an increasing number of self-seeded plants in the garden. 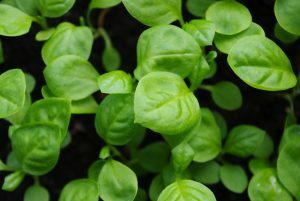 For a good display, the seedlings should be planted closely (about six to eight inches apart) in a mass or as a border around a vegetable or flower bed. 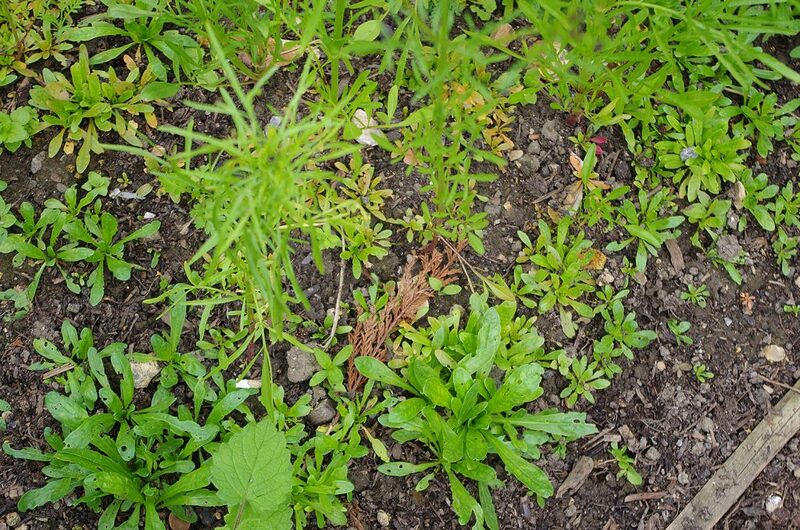 Close planting will also help to keep the weeds at bay. The plants will grow in all types of soil including poor soils low in nutrients. 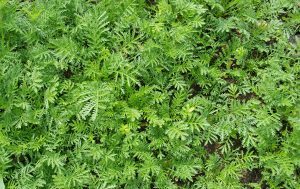 The plants benefit from some fertiliser so it is probably best to crop rotate, growing as a second crop after heavily fertilised Woad or Japanese Indigo. My seedlings need protection against slugs and snails. These pests can easily eat a plant faster than it can grow, with a tendency to munch on a particular plant until it is completely eaten, while nearby plants may remain untouched. I use organically approved slug pellets until the plants are big enough to fend for themselves. This can take quite some time (two to three months). When in full flower the slugs often climb up the stems and chew through the flower stalks, but the damage is usually small. The plants can withstand drought but regular watering in hot dry weather will ensure rapid growth and a good harvest. The first year plants come into bloom from August and flower until late September. Towards the end of Autumn the plants start to look straggly and untidy. 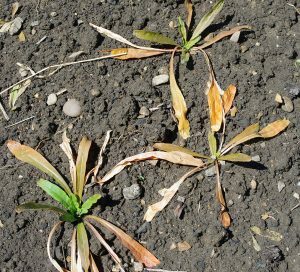 If the plants are cut back close to the ground before the flowering finishes, in September, they will produce some new growth before the growing season ends, which helps the plants to overwinter. In the second year the plants will flower early, from June to August, In both the first and the second flowering seasons, regular picking of flower heads will encourage new flowers to bud. The top flower is mature and full size, nearly all the small florets are open The smaller flower, below, has not long been open. We harvest the flowers every two to three weeks. When the flowers first open they are quite small but increase in size and weight, so we try to only pick the more mature flowers. Once harvested, we dry them in a herb dryer and keep them in storage jars. Drying usually takes several hours and then it is best to leave the dryer switched off overnight before giving it an additional hour the next day. 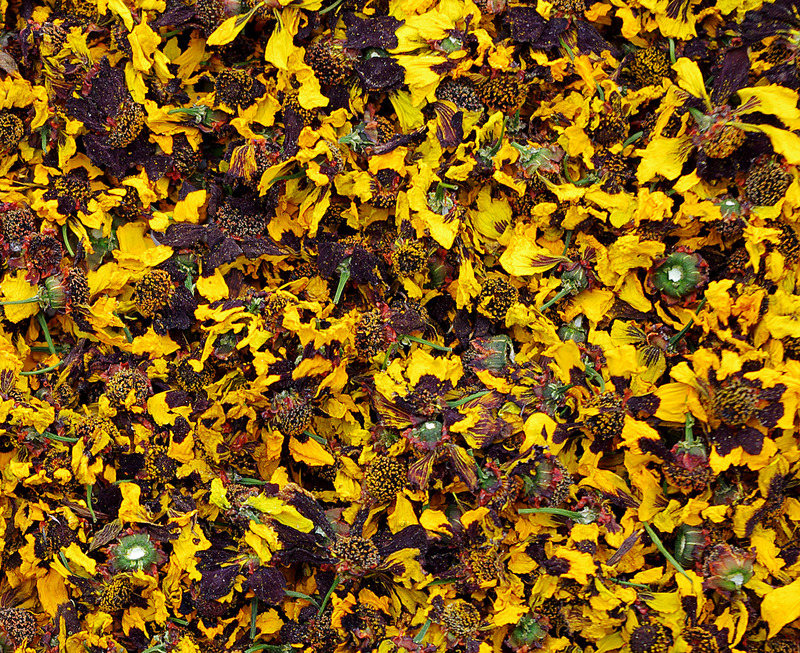 If the flowers are stored even very slightly damp they can become mouldy. 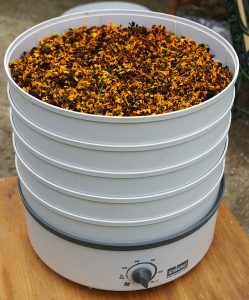 It usually takes two or more harvests to fill one large storage jar, which provides enough dyestuff for a 10 litre dye bath. 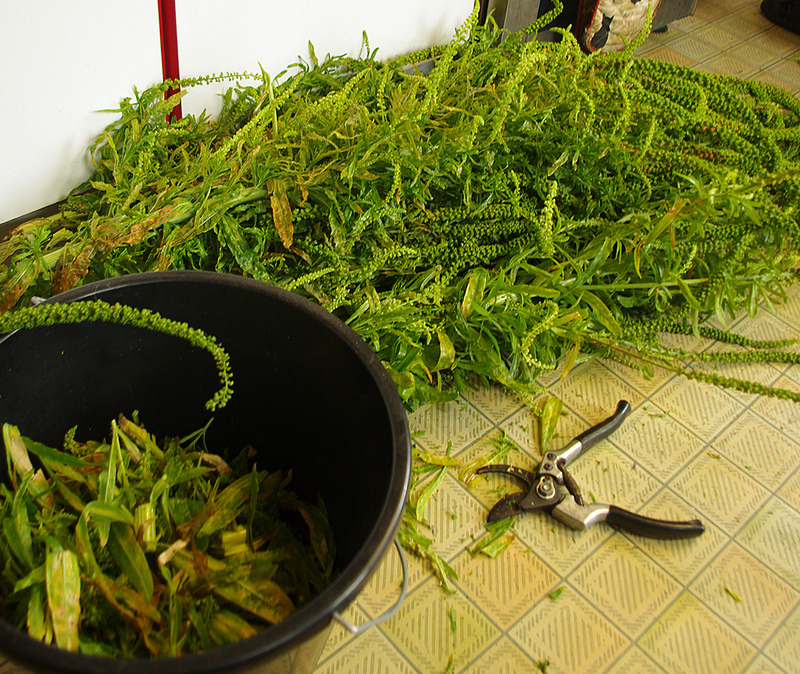 The stems and leaves of the plant also provide some dyestuff, so we sometimes cut the plants back at the end of the season and dry these too. A word of warning about storing Chamomile flowers in poorly sealed containers. 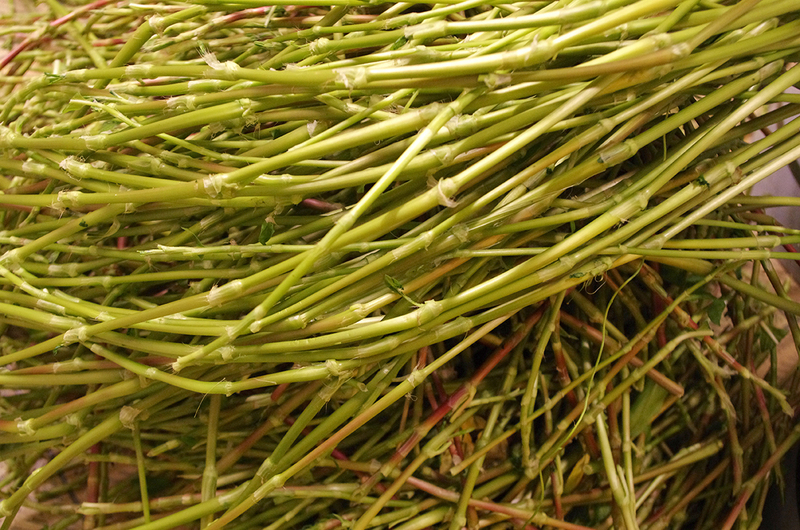 The mature flower heads contain a lot of nutritious seed material. 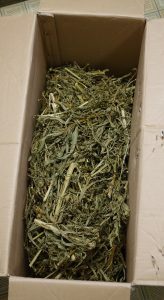 One year we stored mature dry plants in paper sacks inside snap-top plastic storage boxes. But this attracted the attention of “Pantry” or “Larder” beetles which caused an infestation! We now only store dried flowers in fully airtight containers. Old flower heads can be picked and dried for seed. These flower heads are not yet too old to be picked for dye. Seeds can be obtained from the old flower heads which have lost their colour and petals. 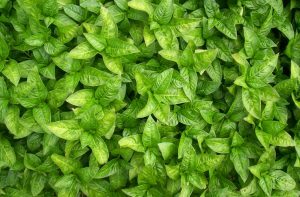 These can be picked and allowed to dry in the sun or left on the plants until dry. The second year plants, having flowered first, will have ripe seeds by August. 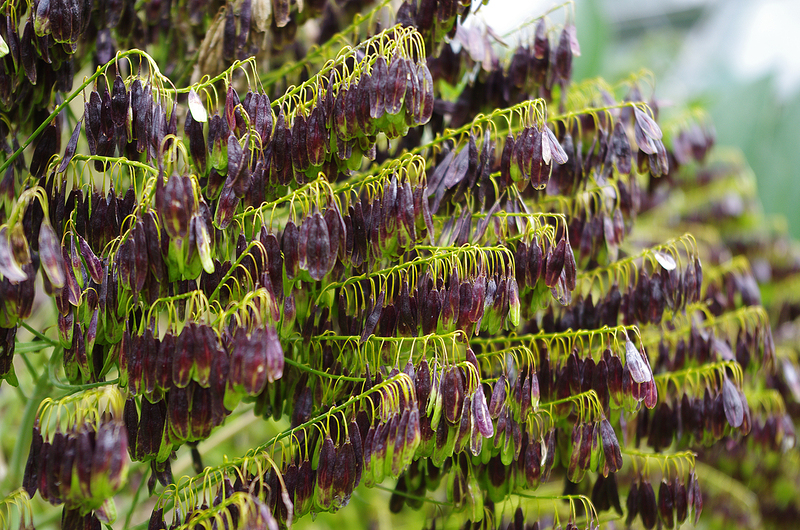 If you are growing a named variety it is likely that over a few years of seed saving the plants will revert to the normal wild type, so may not be as decorative as the original plants but will still produce plenty of dyestuff. Separating out the seeds from the chaff is done by rubbing the dried flower heads to release the seed and then shaking in a tray while blowing the chaff gently out. The seeds, though small, will collect at the bottom of the tray. If you are growing several varieties of chamomile be aware that the plants will readily cross-pollinate. If you want to keep the variety true it’s best to keep them in very well separated beds. 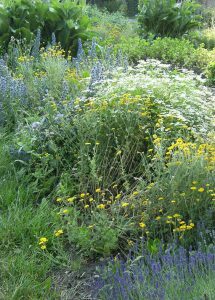 Dyer’s Chamomile in a cottage-garden style planting with Vipers Bugloss, Lavender and Feverfew. 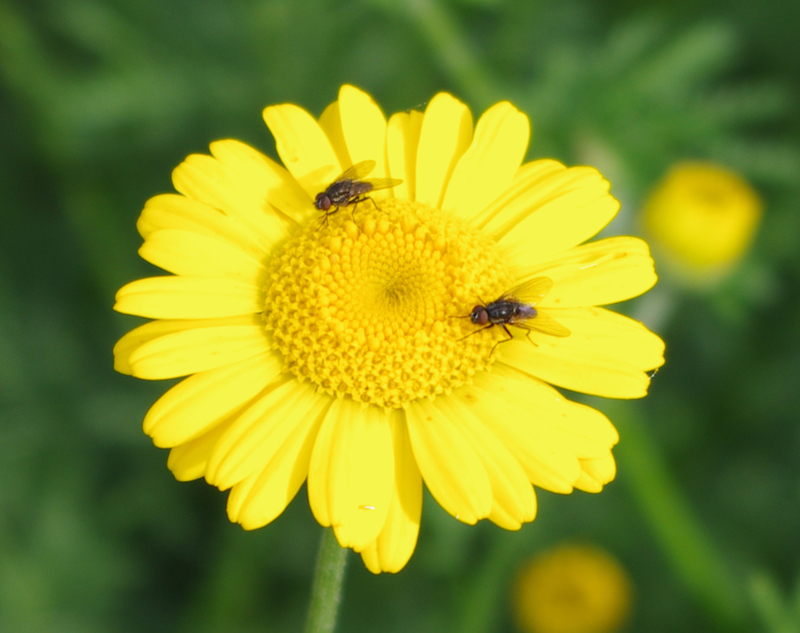 Dyer’s Chamomile is not a strong bee or butterfly plant and only attracts the occasional solitary bee and flies. All the above are flies. 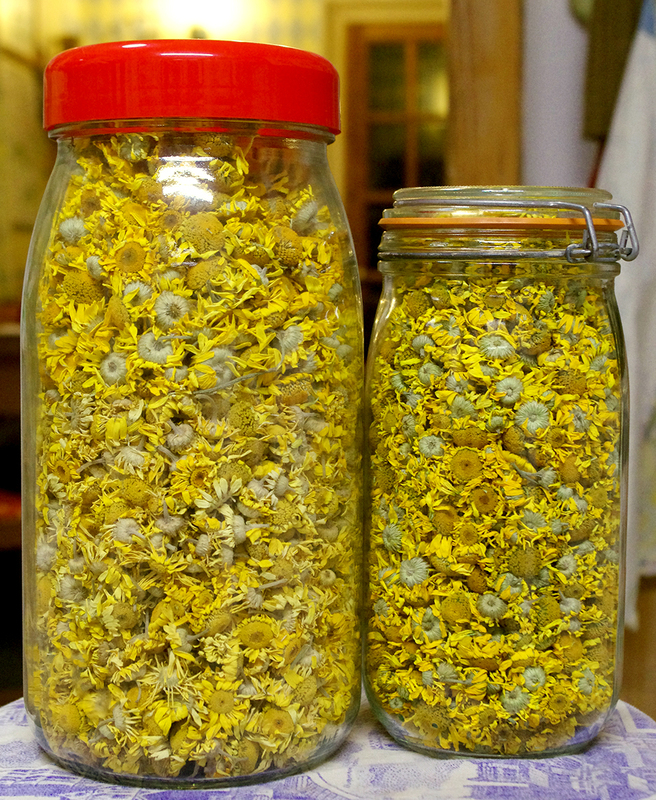 This entry was posted in Ashley's posts, Dyers Chamomile, growing dye plants, Growing Dyer's Chamomile, petit teint yellows and tagged Anthemis tinctoria, Cota tinctoria, Dyers Chamomile, Golden Marguerite, Growing dye plants, Natural dyeing on 25th November 2016 by susan dye. Dyer’s Coreopsis (Coreopsis tinctoria) Plains Coreopsis, Garden Tickseed, Golden Tickseed, or Calliopsis is an annual flower growing from one to two feet in height from the prairies of North America. 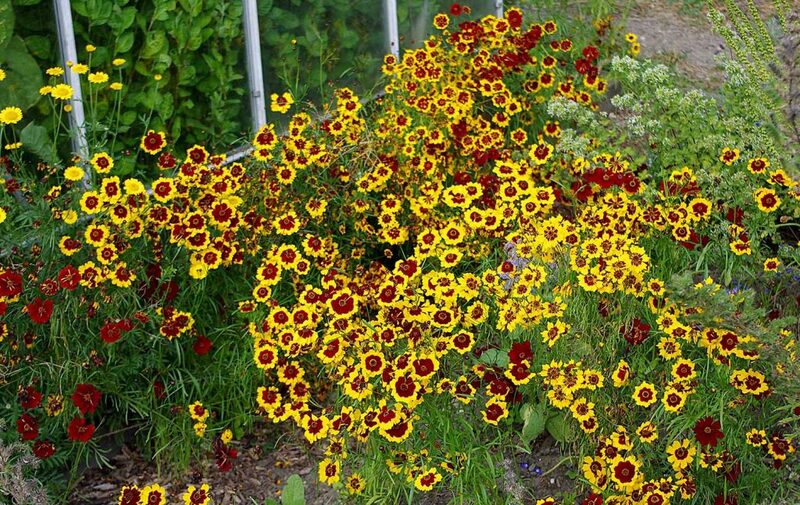 It is very pretty with bright red and yellow flowers, now grown primarily as a decorative garden flower or as part of a “wild flower mix”. 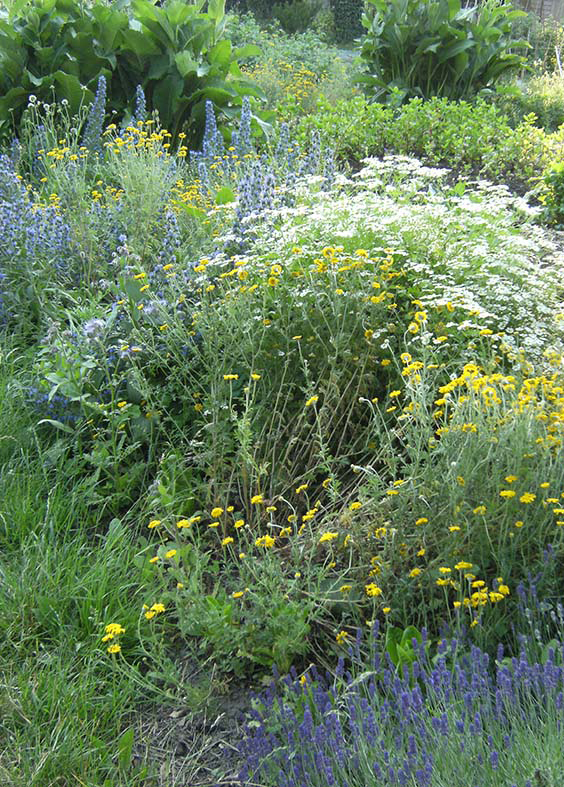 There have been several attempts to cultivate varieties better suited to the garden. I list some of the more successful cultivars below. All of these varieties have been created by careful and rigorous selection and the resulting cultivars will generally breed true. However they will easily hybridise with each other if grown close together. For the novice the best of these may be the dwarf varieties which do not require support. For several years we have been using saved seed, originally from a wild-type variety from Suffolk Herbs (now Kings Seeds). This has produced a diversity of flowers, some almost identical to the varieties above. There is a huge natural variation in flower type which is passed on via cross pollination from year to year. The only named variety we have grown is “Roulette” which was not much different from the wild type. An all red variety with pointed petals. 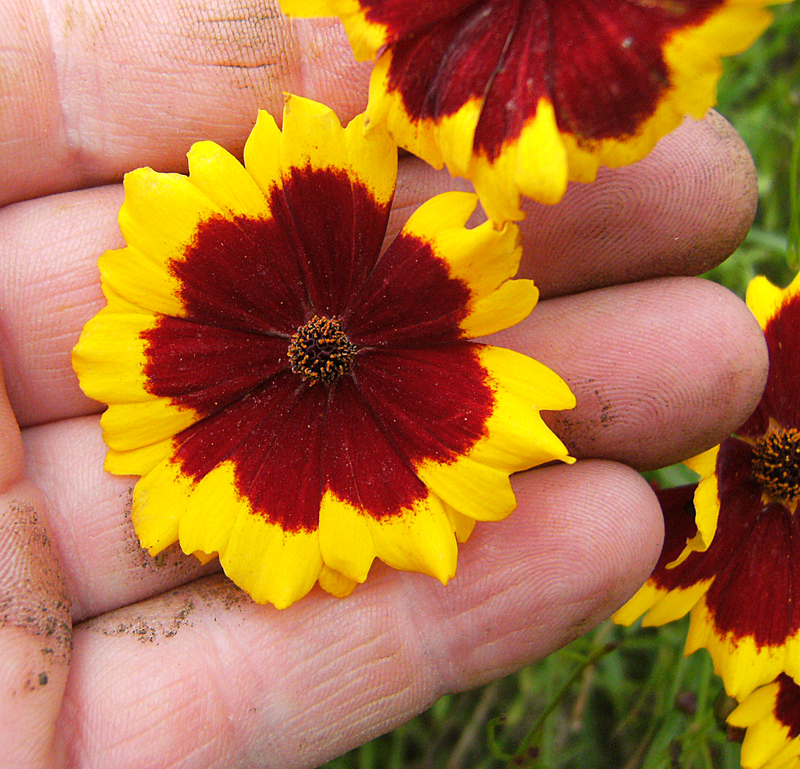 An average flower of Dyer’s Coreopsis. Some flowers have more yellow others less. Dyer’s Coreopsis is part of a huge genus of plants in the Asteraceae family, many of which have also been used as dye plants. Tinctoria is distinctive in having a large proportion of red in the petals, so perhaps most of the dyestuff is in the red pigment? 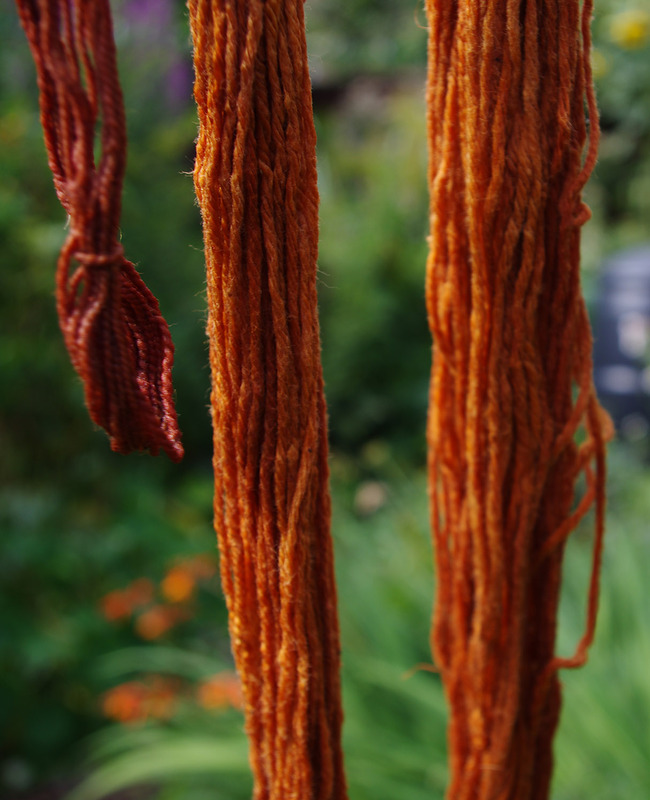 In this case, pure red flowers would be the best for dyeing. 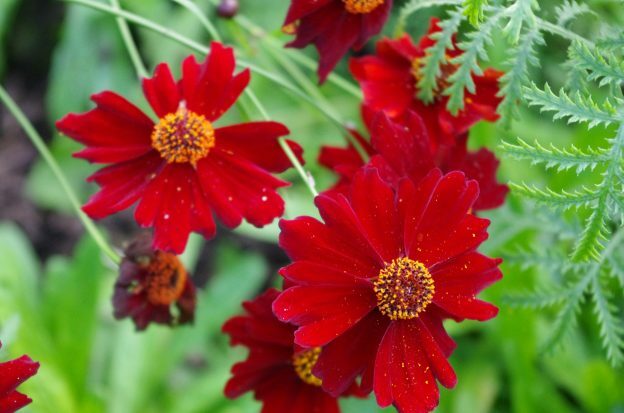 The majority of our flowers are deep red with a yellow outer edge. Some are completely red. A smaller number are intermediate. I would like to know if the red petal colour contributes a different pigment, but as all the flowers have a yellow underside to the petals, regardless of the surface colour, this isn’t an experiment I can do easily. 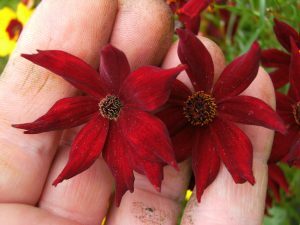 Coreopsis, like Dahlia, contains dye pigments not found in the classic yellow plant dyes of the European Medieval Petit Teint. These are called chalcones and aurones. For a note on the chemistry and history see Dominique Cardon, Sources Traditions, Technology and Science (2007, pp683,4). 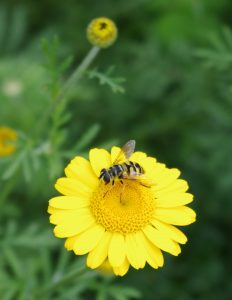 Dyer’s Coreopsis is invariably described as “Perfect for pollinators” by the Royal Horticultural Society, however, we have not seen any evidence of this over many years of growing. Another young seedling with narrow elongated leaflets. 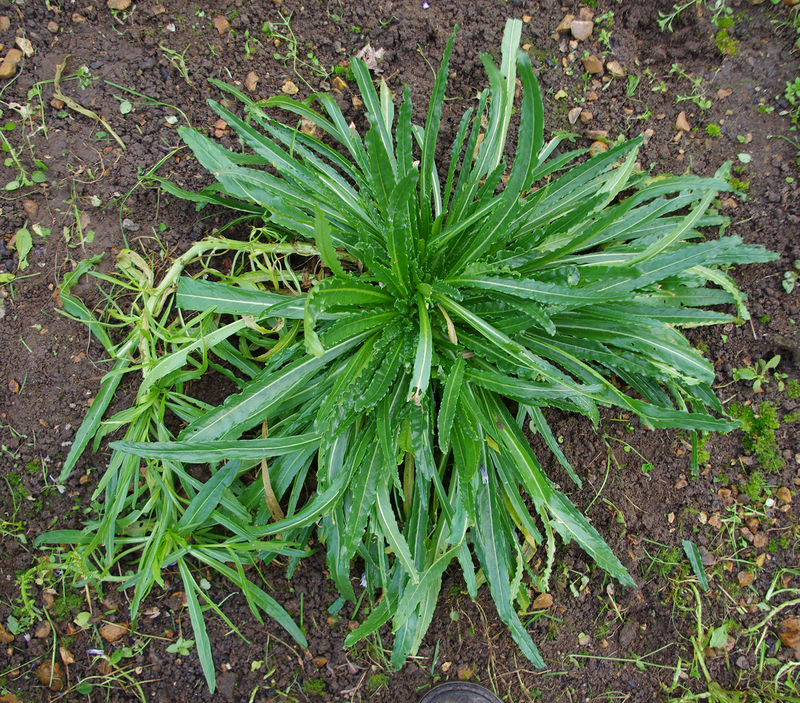 This plant has broken out of the rosette stage and is producing narrow mature leaflets and a flower stalk. A densely planted bed of Dyer’s Coreopsis just coming into flower. 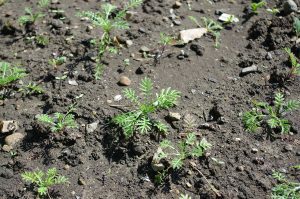 Dyer’s Coreopsis is prone to slug and snail attack so is best sown into seed modules (two or three seeds per module) in April and planted out in May with organically approved slug pellets. Root damage during transplantation will stimulate the plant to flower prematurely so care must be taken. 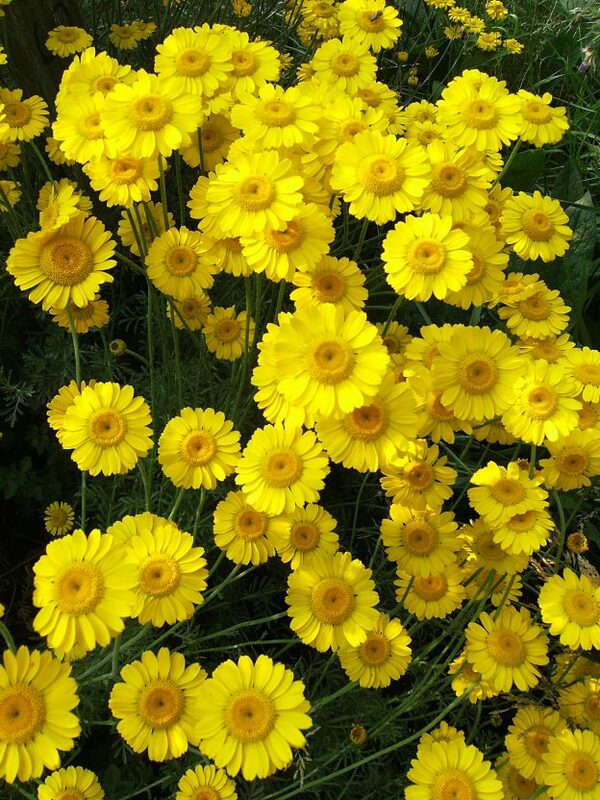 It is generally considered to be hardy and in some areas of North America can be treated as a biennial and directly sown in Autumn for a spring flowering the following year. We tried this in 2018 growing the plants in pots to help keep the slugs off. The results can be seen here. There is great variation in habit, with some plants producing flowers early when the plants are small and others remaining as “rosettes” until late summer. Planting out early, after only a short time in the seed tray, will discourage early flowering. The plants will grow to a good size and give a much better display/dye-harvest. 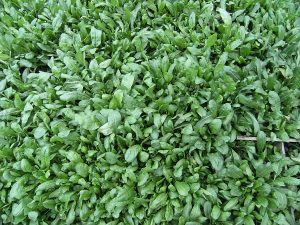 For spectacular displays plant seedlings close together (4 inches apart). Here in Hertfordshire we rarely get any self-seeding (just the occasional plant) so we have to sow from saved seed every year. The flowers of Coreopsis all point south towards the sun, so in order to get the best display, grow them in a place where you can stand and admire them with the midday summer sun behind you. We usually plant these ‘en masse’ in a bed of their own. 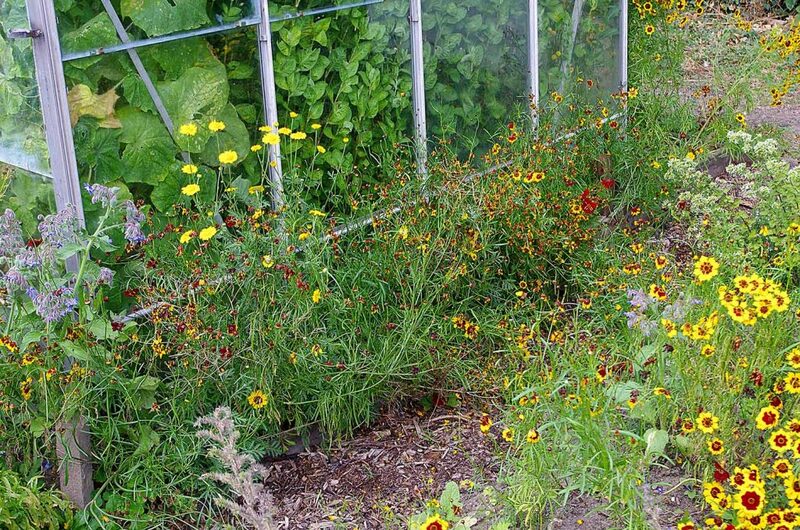 The photograph shows Coreopsis in a narrow bed alongside the southern edge of the greenhouse. In their natural habitat they get the support of other plants. In this location they would have benefited from some support to stop them flopping all over the path. 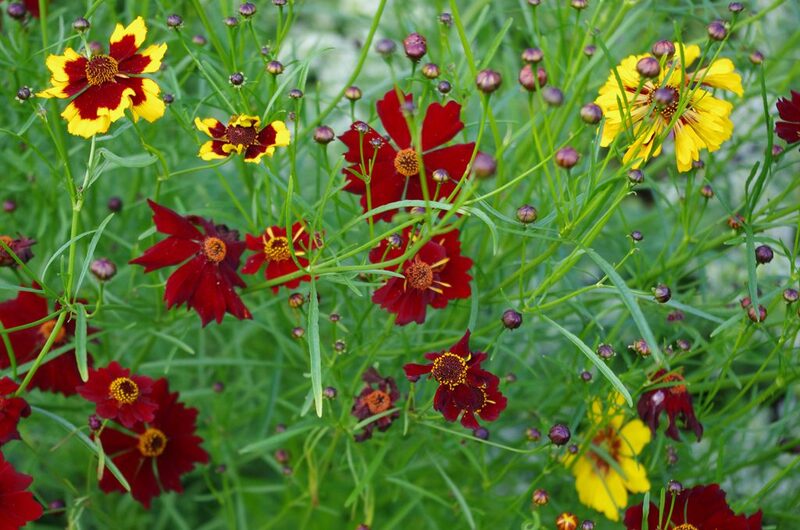 Dyer’s Coreopsis will grow in any soil type and does not require much fertiliser. 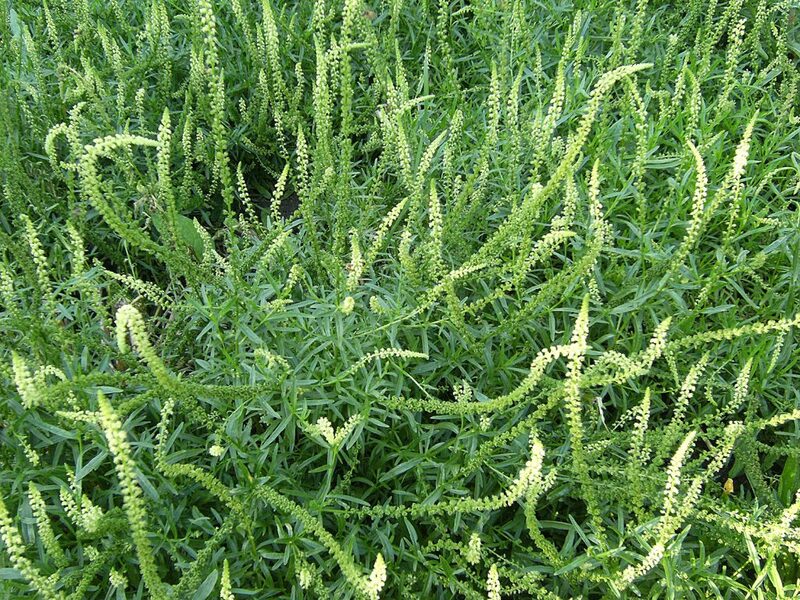 Like Weld, it is best grown in rotation with Japanese Indigo or Woad. In the wild it likes to grow in damp places but prefers a well-draining soil. 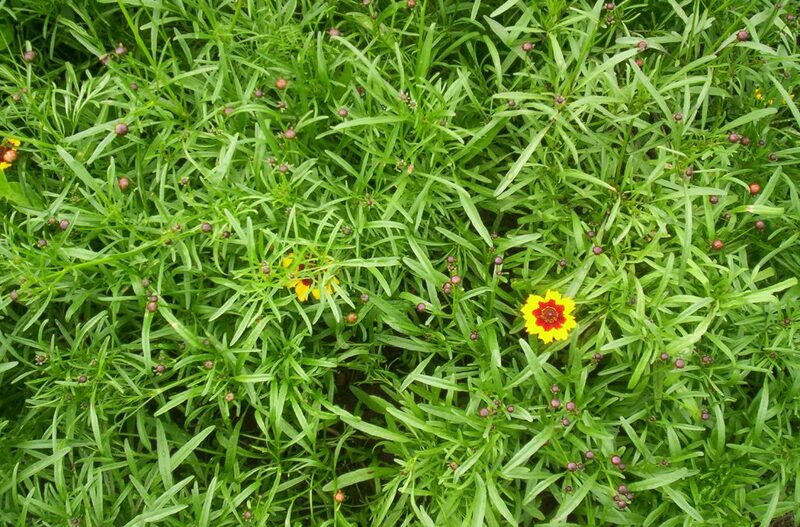 Coreopsis roots are shallow so the plant needs regular watering to grow larger and flower for longer. 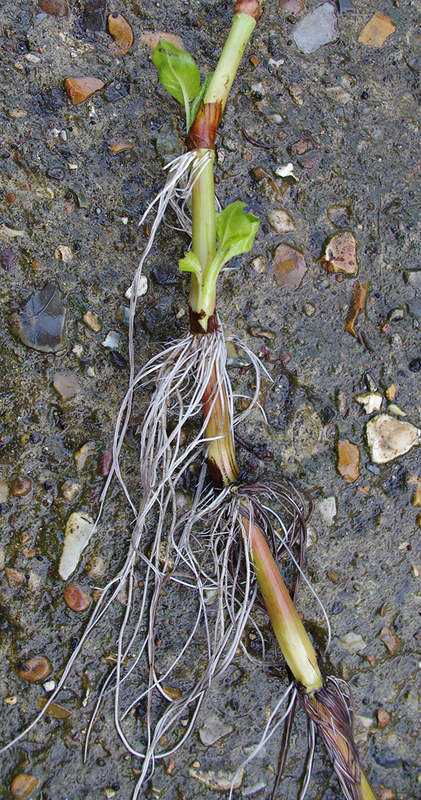 Slugs have the habit of chewing through the main stem which usually kills or seriously delays the plant’s development. Apart from this they do not seem to suffer from other pests or diseases. 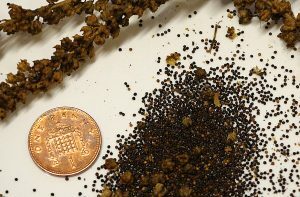 Once the flowers have “gone over” the small rod-shaped black seeds start to mature. 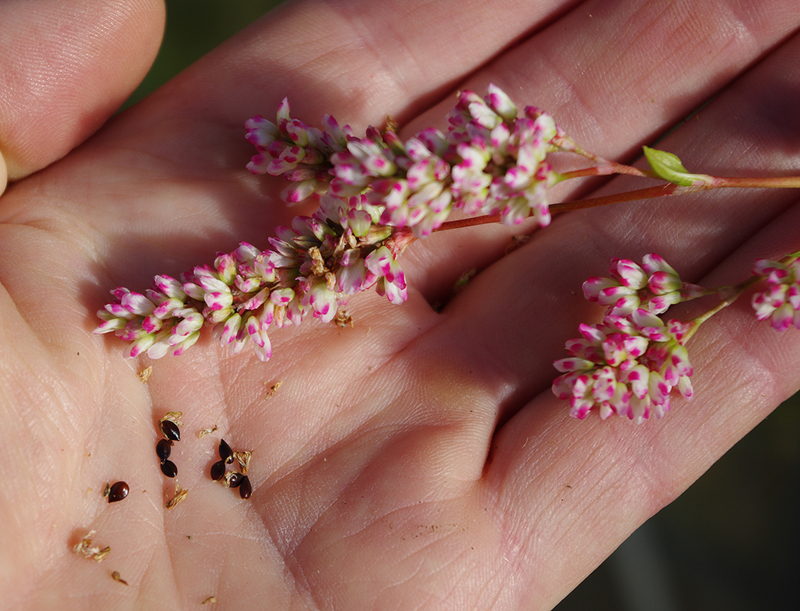 As a rough guide, the seed-heads will be ready for picking after a month. Bring them indoors to dry out completely. Rub the seeds out from the dried flower heads with your fingers into a shallow tray which can then be shaken from side to side and blown gently to remove the chaff. Stored in sealed bags and kept in a cool place, the seeds will remain viable for around three years. 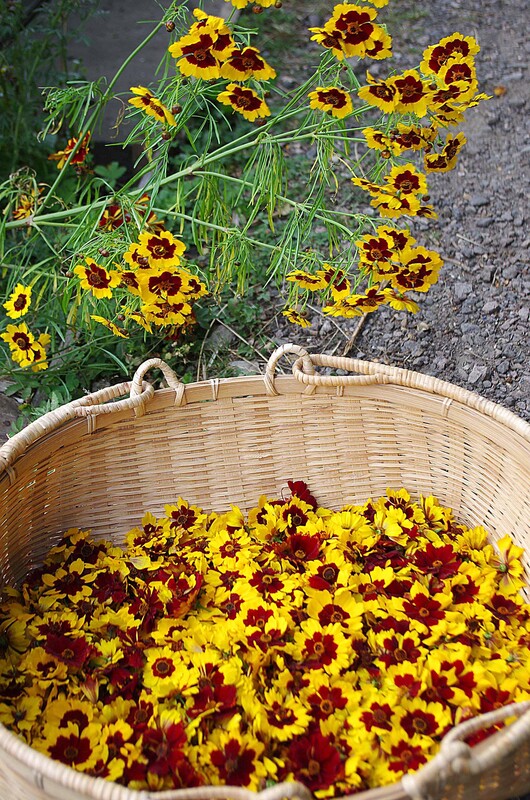 Dyer’s Coreopsis after picking flowers. Here you can see the same bed before and after picking. It took about half an hour to pick all the flowers in the above photos. A small footstool makes the job easier. It’s very calming to slow right down and enjoy the process. Only pick the flowers in full bloom, or those that have gone over. Leave the buds. If you are in a rush, you can pick the whole plant, stalks and leaves included, but it is a terrible waste as the plants will come back into full bloom within a week. We have a weakness for baskets. This is one of a set of five fairtrade baskets Susan bought from Oxfam years ago. They are perfect for flower picking. There’s no need for any cutting tools to pick the flowers. They pinch off very easily, but be careful not to pull them off vertically as the whole plant may come up with the flower. We use a Stockli herb dryer which has served us well over many years. A fan in the base blows warm air up through a stack of trays. It’s well worth buying extra trays. We also use it to dry basil, oregano, rose petals and apple rings. Some flower heads, like Coreopsis, will dry in just a few hours but fatter flowers like Dahlia need a couple of days. To store well, herbs and flowers must be absolutely dry. Keep going until they feel dry to the touch. Then leave them for 24 hours in the trays in a dry place for any moisture remaining in the flowers’ centres to be drawn out. Then give them another short drying session (about an hour). 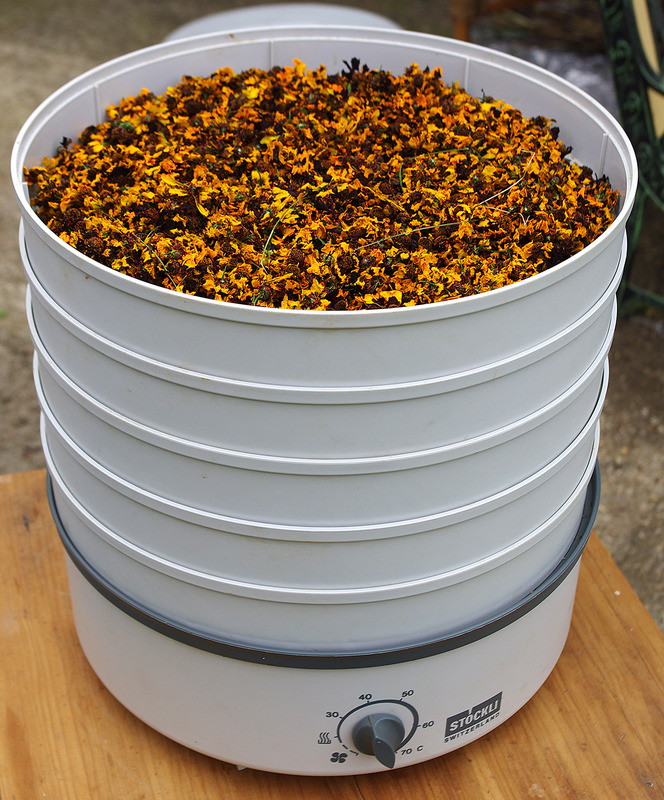 This will reduce the risk of the flowers going mouldy in storage. Make sure your container is truly airtight and store in a cool, dark, dry place. If you have done a good job the dried material can last for years. 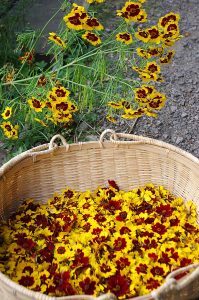 The dyes in Dyer’s Coreopsis are highly soluble, so all that’s needed is to pour on boiling water and leave the flowers to soak. Susan added the dyestuffs to the baths in two batches. The yarn and one silk/cotton swatch went in with the hot water at the start. These were left for several days, removed and rinsed. The paler coloured cotton drill, cotton jersey and the other swatch of silk cotton were left in the exhaust bath for 48 hours. Again unheated. The results tend to confirm Jenny Dean‘s note in her book Wild Colour, that there are at least two pigments in the flowers, a red and a yellow. The red is probably taken up quicker than the yellow, hence the orange tone (yellow+red) is restricted to the early phases of the bath. The exhaust bath only contains the yellow. 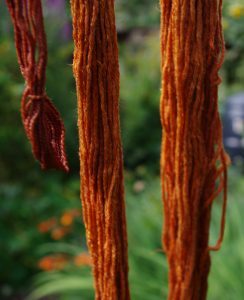 Dyer’s Coreopsis on silk cotton, main bath (left) and exhaust bath (right). 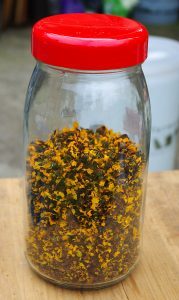 This entry was posted in Ashley's posts, Dyer's Coreopsis, growing dye plants, Growing Dyer's Coreopsis, Growing Dyers Coreopsis Main article, petit teint yellows and tagged Calliopsis, Coreopsis tinctoria, Dyer's Coreopsis, Garden Tickseed, Golden Tickseed, Growing dye plants, Natural dyeing, Plains Coreopsis on 24th November 2016 by susan dye. Weld or Dyer’s Rocket (Reseda luteola) is a UK naturalised biennial wild flower that prefers to grow on chalk or limestone soil. 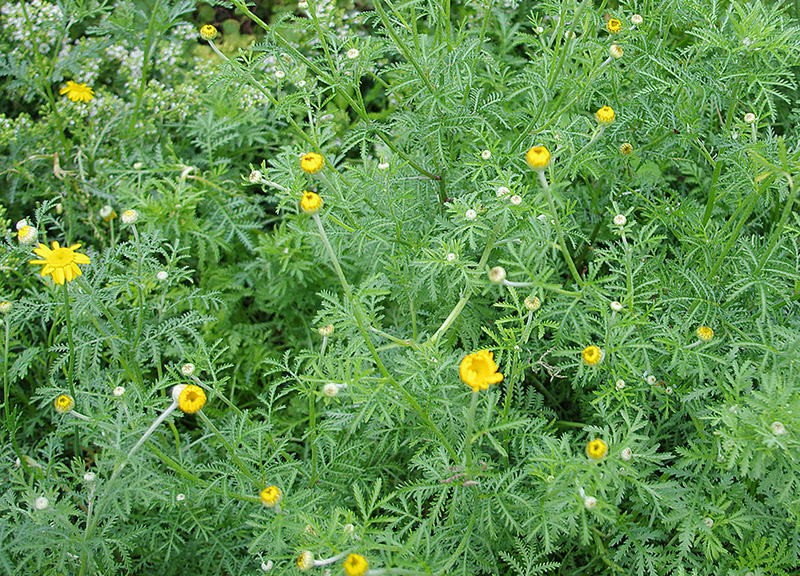 It has pale yellow flowers and can grow to over two metres in height in its second year. The adult flowering plants are often seen growing in great masses on waste land or recently disturbed ground and may then mysteriously disappear only to pop up somewhere else another year. 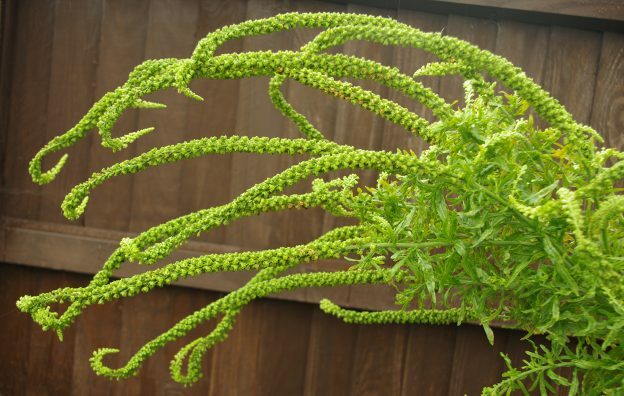 It has one common close relative, Wild Mignonette (Reseda lutea) which can also be used as a dye plant. Sweet Mignonette (Reseda odorata) is a closely related plant from the Mediterranean often grown in gardens for its attractive scent and as a bee attractant. All of these plants are well known for their perfume which is particularly noticeable when the plants are dried. 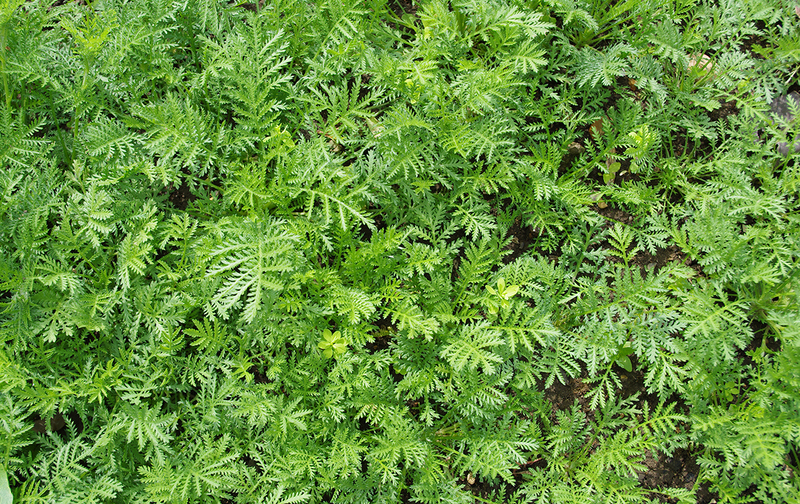 As a biennial, Weld is usually expected to grow from seed into a “rosette” in the first year. 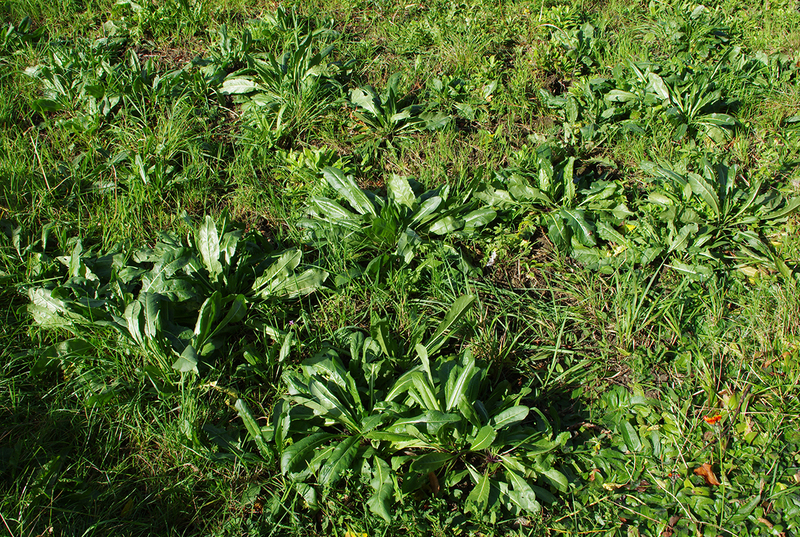 A rosette is a ground hugging form, where all the leaves grow from a central point. 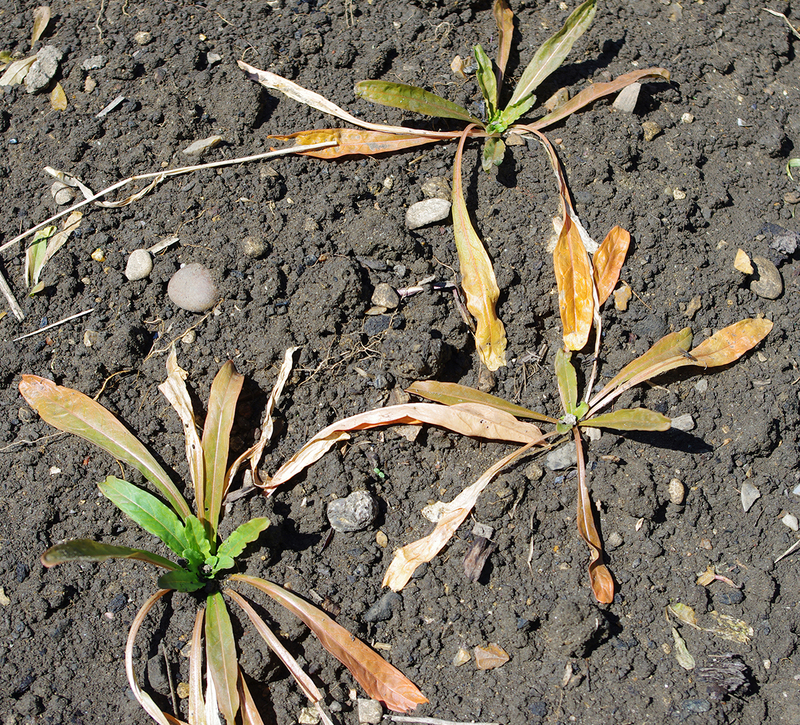 The plant goes through the winter as a rosette, when there may be some die back during cold frosty weather. 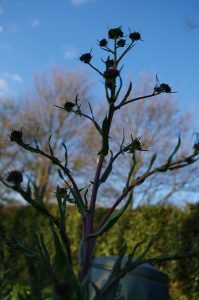 In the Spring the rosette grows new leaves and the central stem starts to emerge into a tall flower spike. Once flowering is over the plant is expected to die. Well that’s the official line, but anyone who has grown biennials will know that it all depends on how the plants are grown (see photo). Above, large Weld rosette in October it has tried to put out a flower stalk but the shortening day length has stimulated it to return to its rosette stage. Below, Weld in full flower. 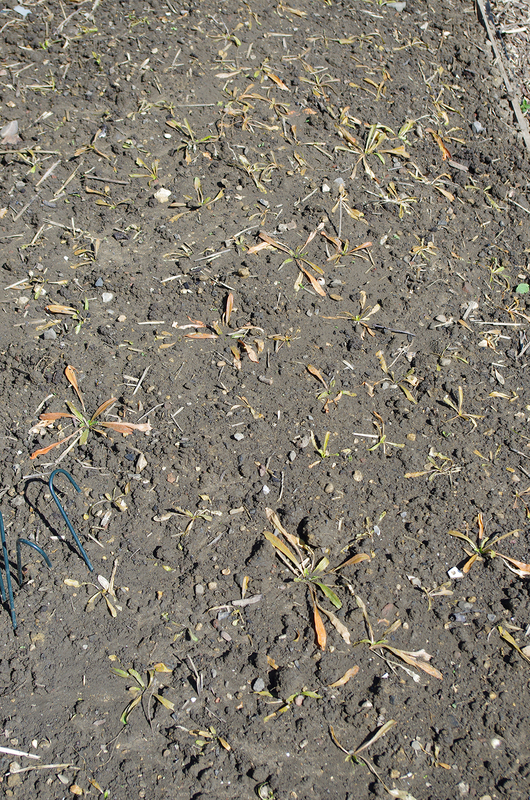 Left to its own devices, weld seeds get scattered from mid-Summer onward. Some of these seeds will fall to the ground and germinate during late Summer and Autumn and grow into rosettes as expected. Other seeds will lie dormant in the soil and await an opportunity to germinate, usually afforded by a disturbance to the soil (animals rooting about for grubs or roots or a gardener tilling the soil). 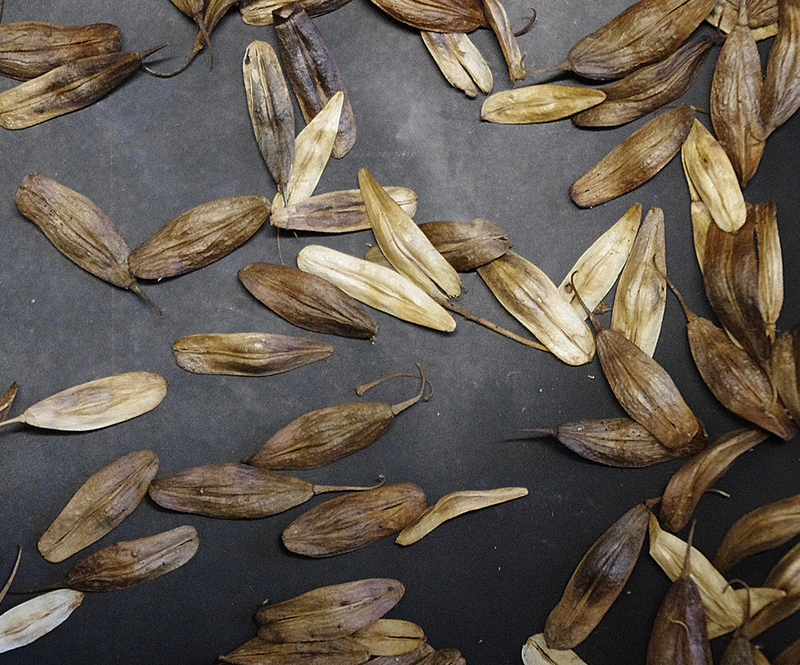 These seeds will take their chances to germinate at any time of year when the weather is warm enough. Some seeds will germinate in early Spring and, if the conditions are right, may complete their entire life cycle in one year. If the plants are stressed for any reason e.g. by drought or physical damage, they are even more likely to flower. The later in the season the seed germinates the more likely it is that it will flower in the following year. 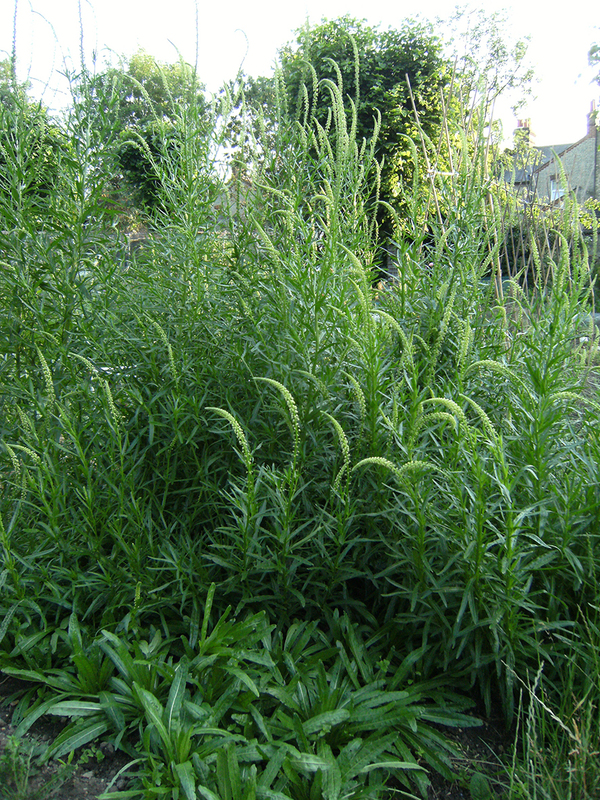 Weld’s rather random flowering behaviour makes it an awkward plant to cultivate. It is also highly sensitive to any kind of root damage, so transplanting seedlings invariably results in numerous casualties and transplanting an adult plant is almost impossible. 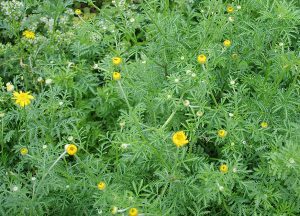 It is quite often the case that the best plants the garden grows are those that have self-seeded in a path or on the vegetable patch – in fact anywhere except the bed you have set aside for growing Weld! It is not for nothing that Weld is generally regarded as a pioneer plant – one of the first to colonise waste ground. The gardener interested in growing Weld for dyeing will seek to grow as large a plant as possible. This means allowing the rosette plants to build up good food reserves in their deep tap roots before shooting that ‘rocket’ of a flower spike up into the sky. This requires a certain amount of garden pampering and a choice of strategies. The same bed about two months apart. 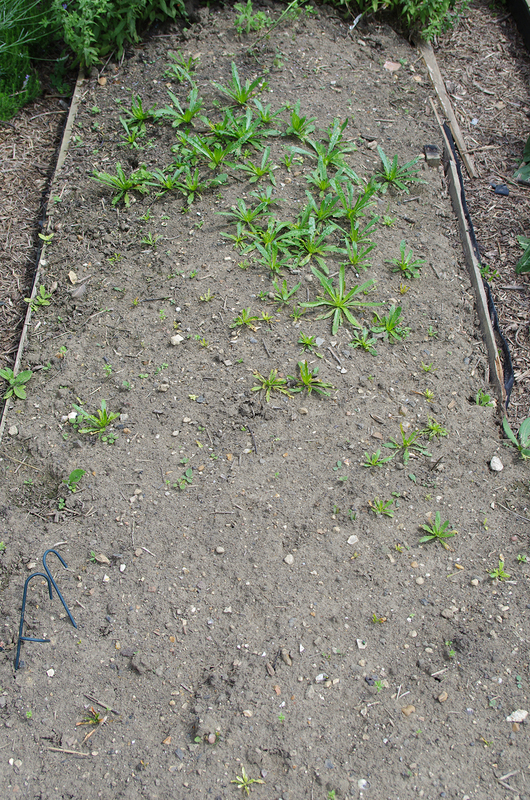 On the left the weld seedlings have been planted for a week or two and the leaves have turned brown. Two months later many of the plants have died. Sow seed thinly into modules in early April under glass or indoors. 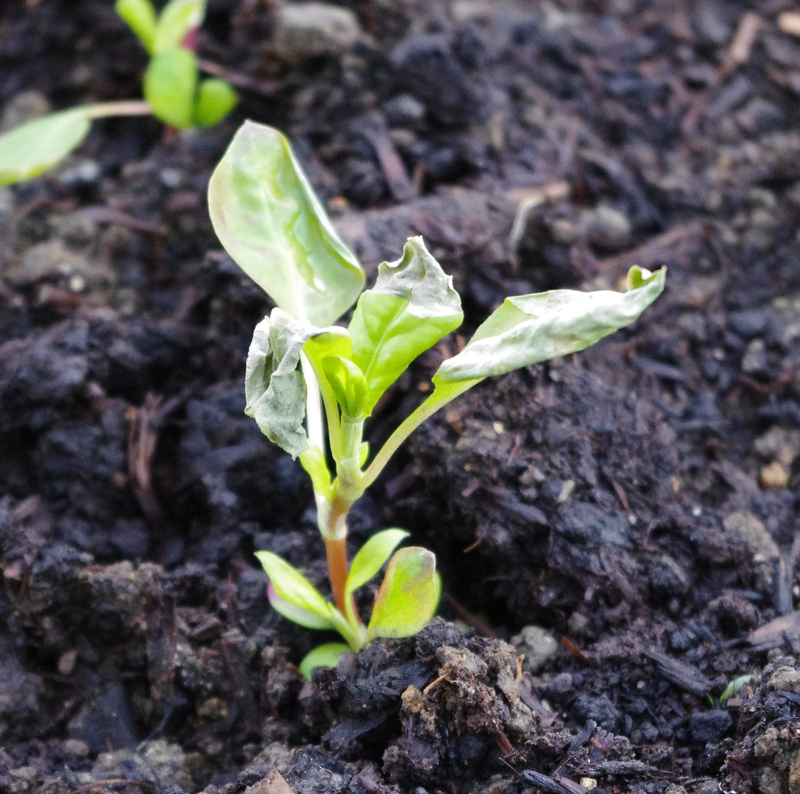 Do not cover seeds with compost as light helps them to germinate. 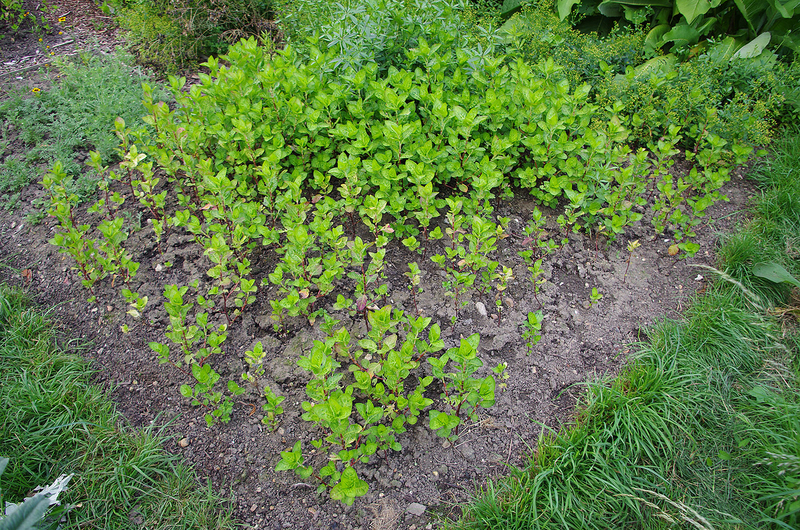 When the plants have grown to around the five to ten leaf stage, carefully plant out into prepared beds in mid-May. Do not add any fertiliser to the soil as research shows dye yield falls with increased nitrogen, but do water as needed. Continue to water the young plants, particularly in hot weather, and weed throughout the year. With luck, some of the plants will grow large and flower in mid or late summer when they can be harvested. Sow seed thinly into modules in late August and plant out carefully when large enough and water regularly, particularly in hot dry conditions. Allow to grow and go through winter and they will flower in June/July the following year. Self-seeded Weld with a few Dyer’s Coreopsis plants I planted in the gaps to brighten the bed up a bit. 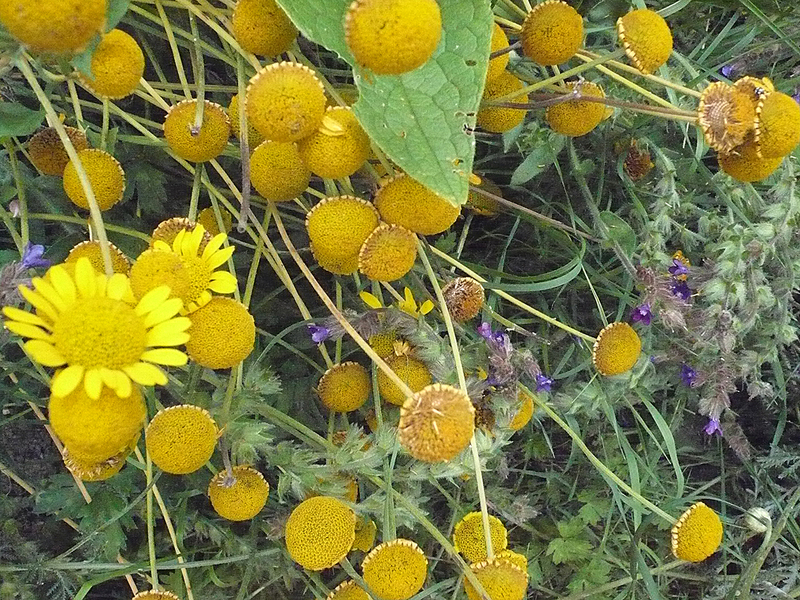 Obtain some seed heads from wild Weld and scatter the seeds in great quantities directly onto prepared beds in spring. Keep beds watered and weeded. 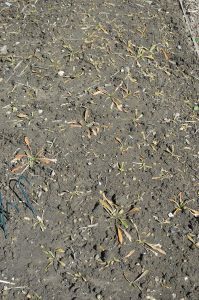 Scattering a few organic approved slug pellets will help to protect the young seedlings which may or may not germinate. Mature flowering plants in the background and first year rosettes growing in the foreground. Now if this all sounds a bit hit and miss, it is! 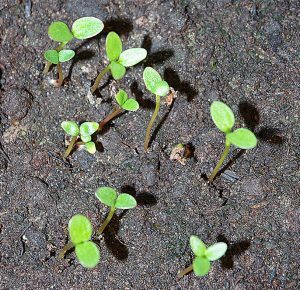 When I grow the seeds under glass or indoors I certainly get excellent germination but lose many seedlings on planting out. Enough, however, survive to produce adult plants some of which I allow to set seed. If this is done over several years the seeds accumulate in the soil and self-seeding will start. Note: to stand any chance of self-seeding the soil must be kept bare i.e. 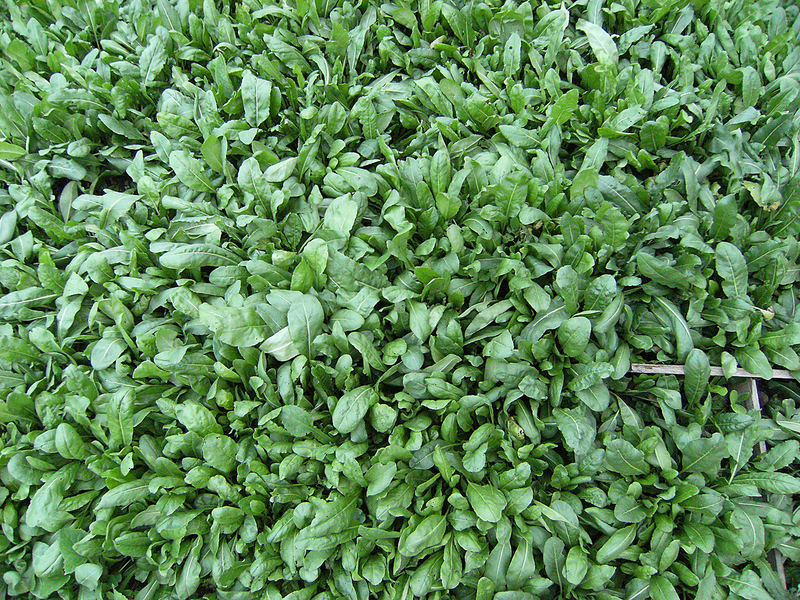 free of weeds and any kind of mulch (mulch suppresses seed germination and harbours slugs and snails). Remember, Weld is a pioneer plant and does not like competing with vigorous perennial weeds. 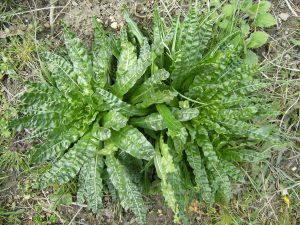 Small rosette plants can be moved from inconvenient positions if carefully dug out with a large clod of earth around the roots. 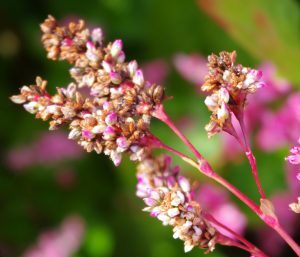 Weld does not make a particularly attractive garden plant in its rosette stage but if grown in ‘mono-culture’ it can put on a surprisingly good show when it flowers. If there are gaps in the first year Weld bed you can interplant other dye plants for added colour. Coreopsis is particularly good in this respect as it is an annual. Right, dried Weld and Left, freshly harvested Weld being cut up ready for dye extraction. Harvesting the plants just after they begin to flower in June is generally considered the best time. 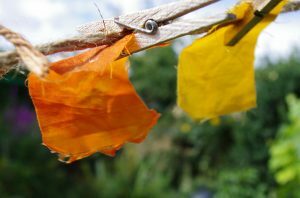 As the leaves begin to die off the amount of yellow dye starts to diminish, however, dyestuff can be obtained from the rosette leaves and from old plants that have finished flowering. All parts of the plant except the roots yield dye, including the stalks. Weld plants can be very big and take up a lot of storage space. If the plants are hung up to dry somewhere warm, dry and dark they will remain green, but if dried in the light they will turn a straw yellow or even bleached white. They will however still give good dye colour. 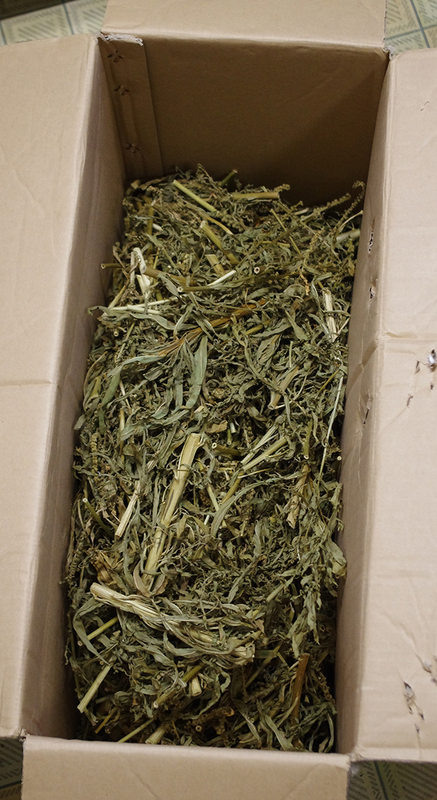 Once dried the plant can be chopped up to save on storage space and kept in boxes, bags, storage jars etc. in a dry place. 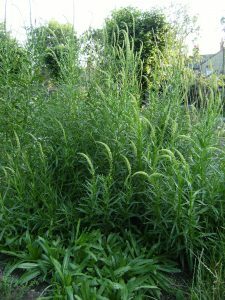 Weld is often found growing on waste or disturbed ground, road verges and rail cuttings, so it is not that likely that anyone would complain about people picking it. However, the law is clear “it is illegal to uproot any wild plant without permission from the landowner or occupier. Uproot is defined as to dig up or otherwise remove the plant from the land on which it is growing, whether or not it actually has roots”. Occasionally we do harvest from the wild but we always try to be responsible by cutting the plant stalks (not pulling up the roots) and leaving plenty of plants to seed. This entry was posted in Ashley's posts, Grand teint, growing dye plants, Growing Weld, weld and tagged Dyer's Rocket, Grand teint, Growing dye plants, Natural dyeing, Reseda luteola, Weld, Yellow dye on 19th November 2016 by susan dye. Japanese Indigo, Persicaria tinctoria or Polygonum tinctoria is a frost tender member of the knotweed family. Originally from China and Vietnam it likes to grow in warm moist climates, often as a waterside plant. Our closest relative in the UK is Common Bistort or Persicaria bistorta which closely resembles Japanese Indigo but has no trace of indigo in its leaves (I did try once) though it does give a pleasant orange on alum mordanted material. 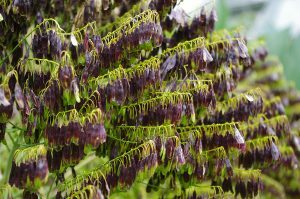 Japanese Indigo will grow from seed to flower in one season and, if it does not get frosted, is capable of growing into the second year though here in the UK getting a plant through the winter is very difficult even indoors with extra lighting. We grow Japanese Indigo because it gives more indigo than Woad (approx. double the amount) and the colour is generally cleaner and more predictable than Woad. There appear to be two distinct varieties though I have not seen anyone put a name to them. Pointed or long leaf Japanese Indigo. This is grown as an indigo dye crop in Germany and has probably been selected for its ability to grow in a northern climate. It is a more robust plant tolerating colder weather and flowers much earlier. 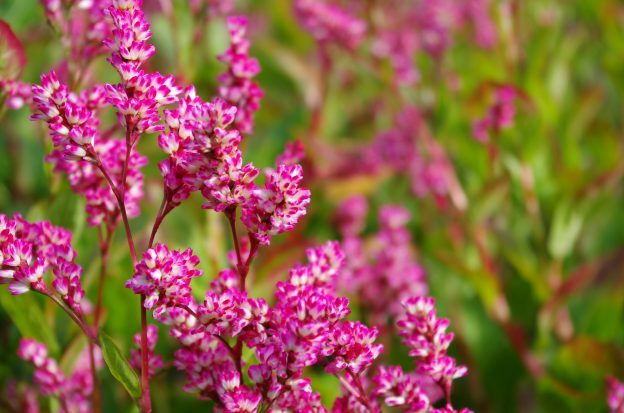 It has pale green occasionally pinkish stems and white or pink flowers which grow on elongated flower stems. The leaves are large narrow and pointed. Broad or rounded leaf Japanese Indigo. 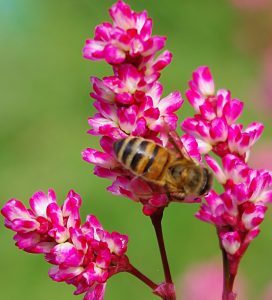 This is the variety most commonly grown in gardens, perhaps because it produces a profusion of pretty deep pink or white flowers. Its stems are thick and also have a tendency to be pink. 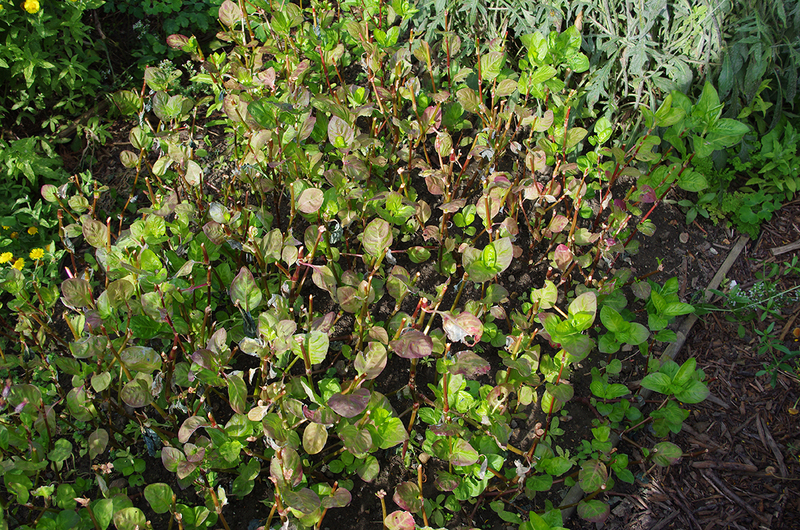 It seems less adapted to a northern climate and in poor weather struggles to grow – when first planted out, the leaves often go pink or yellow at the tops of the stems and continue like this if growth is slow. 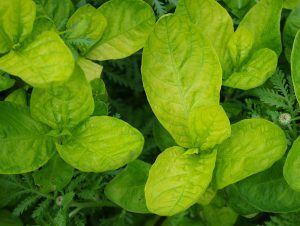 When grown in a greenhouse or polytunnel however the plants are greener, although I have not noticed any difference in indigo production between the two, (see link to article on comparison of three different strains above). 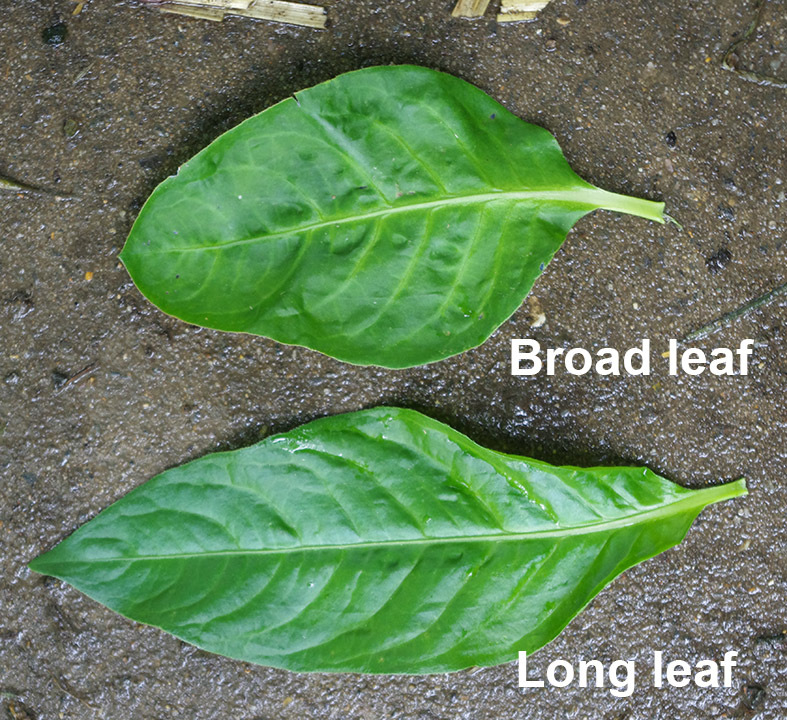 Comparison of Broad leaf and Long leaf Japanese indigo. Some of my seeds are “tricotyledons” and these germinate with 3 baby leaves rather than the usual 2. This is an uncommon mutation and may be a sign of inbreeding. 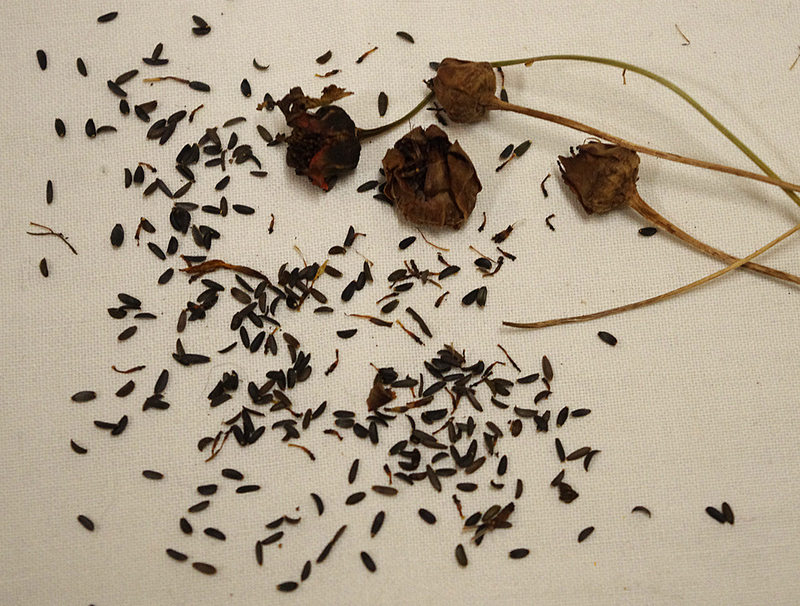 The shiny black seeds have only a short life (about a year if stored in a cool dry place). They can be frozen in the freezer and will last longer. To freeze the seeds first dry on a windowsill then place in a sealed plastic bag with a packet of silicon desiccator for a few weeks then pop in the freezer. Note: seeds frozen in this way tend to germinate slowly and may take up to 5 or 6 weeks to germinate. Commercially bought seeds are often stored frozen so don’t be too alarmed if you get no germination’s in the first 2 weeks. Interestingly I tried drying some seeds with a hair dryer on a low heat setting from a distance and found that this treatment also put the seeds into a deep sleep. So, using some fresh seed grow in heated seed trays indoors from early April or late March. Sow thinly and cover with a thin layer of compost. 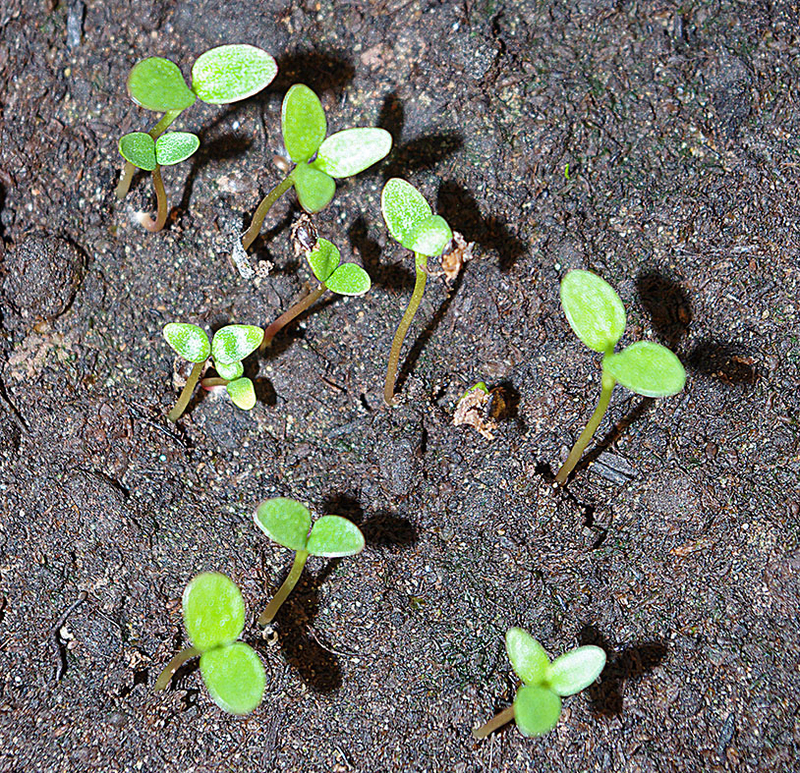 Once germinated try to give them as much light as possible as they will grow “leggy” if kept on an average windowsill. The seeds should germinate readily within two weeks but occasional seeds may not germinate for a month. 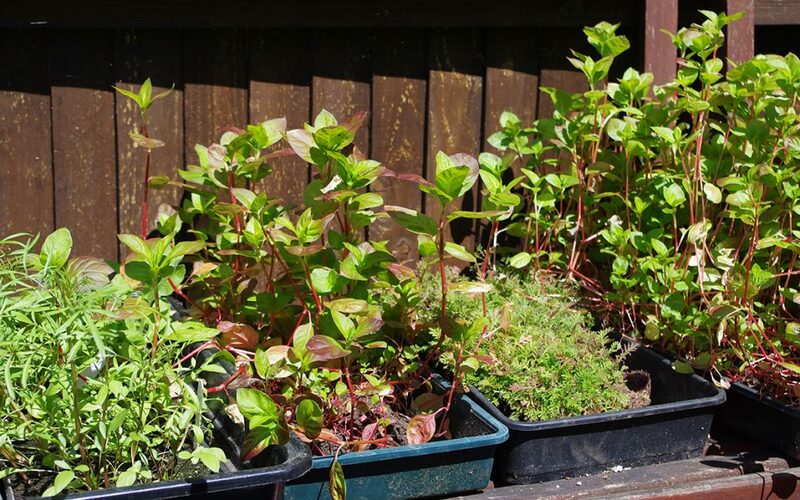 The plants are very robust and rarely succumb to disease or pest, they will also transplant readily and can be pricked out at an early stage and potted up if you wish to do this. I usually leave them to grow in the tray until I am reasonably sure there will be no more frosts. Here in Hertfordshire that’s usually around the 6th May. By this time the plants will be quite large and the trays root-bound, some of the plants will have put out secondary roots from the stems and rooted in more than one place. Separating the plants out is therefore difficult and it is best to soak the tray in a bucket of water before trying. Do not worry about breaking the roots as Japanese indigo will re-root itself with ease. Planting in May is only advantageous if the forecast is for warm and sunny weather. If the forecast is for cold overcast weather wait until June before planting out. Trays of dye plants waiting to be planted out including some root bound Japanese indigo. These Japanese indigo plants show a typical growth pattern when planted on mass with the larger plants towards the middle and smaller plants at the edge. Weather is critical for good plant growth as you must remember this is a semi tropical plant. Sometimes the weather never really becomes ideal, in the cool dark summer of 2012 the plants grew hardly any larger than when I put them out. The plants were pale and looked sickly and there was no harvest. This year (2016) many of the plants also grew very slowly because the weather in the early part of the season was cool, wet and cloudy. It was not until late July when the weather improved that they really started to grow. If you have plenty of seedlings you can plant them about 4 inches apart in a heavily manured soil. 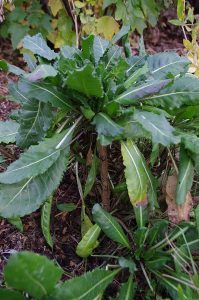 Both Woad and Japanese indigo require lots of feeding to get a decent sized plant. Manure is the best if you can get it, but other fertilizers will do. Soil type is not much of an issue and the plants will grow on any soil. Clay loams are probably the best. My plants are grown on a poor chalk soil and I have problems with some nutrients in the soil being used up very quickly. Crop rotation is important for me as the plants do not seem to grow well if planted in the same area as the previous year. All my indigo beds need to be given a second feed in August particularly if I cut a first crop and allow the plants to regrow. 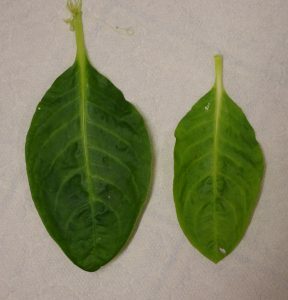 Even so, many plants regrow with yellow leaves indicating they are short of some vital nutrient. Rows or Beds? – I mostly grow indigo in beds on mass simply because I have limited room in the garden. Every year however, I notice that the plants at the edge of the beds grow weakly and the plants in the middle are the largest of all. I do not know the reason for this but speculate that the plants thrive best when in competition with each other or there is some symbiotic relationship which allows the plants to benefit each other. I am inclined to the former as the plants also tend to grow larger when in competition with entirely different species. Either way I also speculate that growing the plants in rows is not ideal as the plants are not as close to each other. 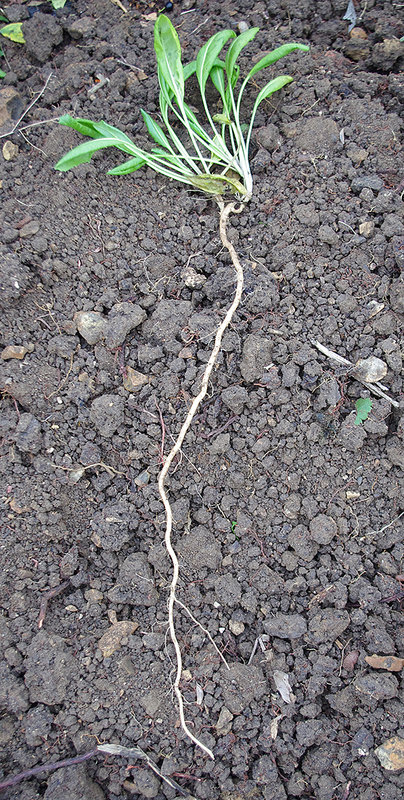 Roots grow readily from the stem nodes. 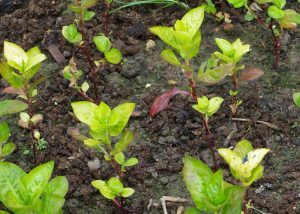 Propagation via cuttings – If you only have a few plants and want to grow more from cuttings you are in luck as Japanese indigo is one of the easiest plants to grow this way. Just cut off the stems from about 6 inches above the ground and place in a container of water. New roots will grow immediately from the stem nodes and the cuttings will be ready to plant out in two weeks. Alternatively just stick the cuttings directly into the ground and water well (each day in hot weather) until the new plants are established. 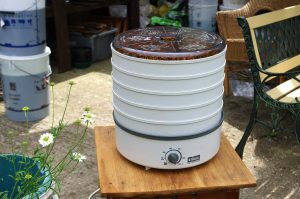 Overfeeding – I used to think that it was impossible to overfeed Japanese indigo but in the summer of 2017 I did overdo it a bit with some fish, blood and bone fertilizer which is particularly concentrated. The plants can become scorched, deformed and yellow. Initially the damage looks very much like early frosting as the leaves die off, turning the characteristic gray blue. Later the surviving leaves turn yellow and can become deformed. If they survive they will eventually recover without any lasting problems. Early leaf damage due to over feeding with Fish, Blood and Bone fertilizer. Yellowing of leaves due to overfeeding. Under-watering – Easily done if you go on holiday or just forget during hot sunny weather. Once again the effect on the plants is similar to frosting and overfeeding. 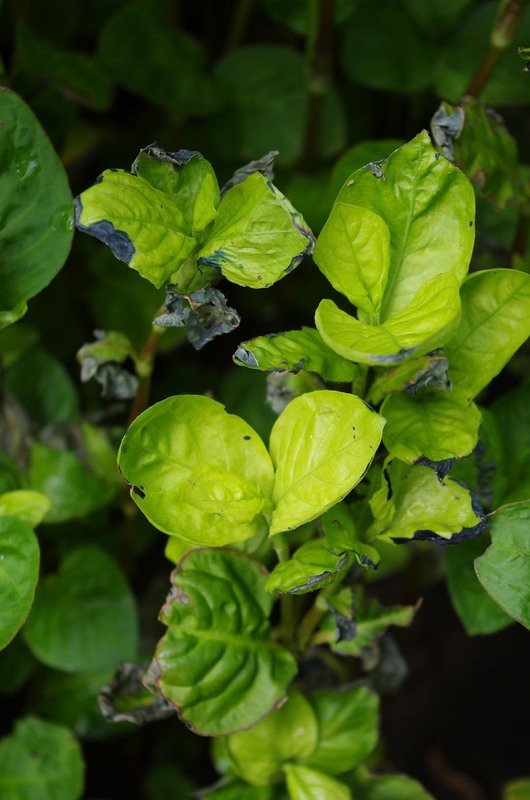 Frost Damage – After the first frosts of the Autumn the upper exposed leaves are usually damaged first and turn a dark blue-gray. The indigo has become fixed into the leaf and can only be extracted if the leaves are placed in a reducing dye bath. (Reducing agents are fructose, spectralite (Theourea dioxide), sodium dithionite or a fermentation bath). Early Frost damage on Japanese indigo showing characteristic blue gray areas where the plant tissue has died. 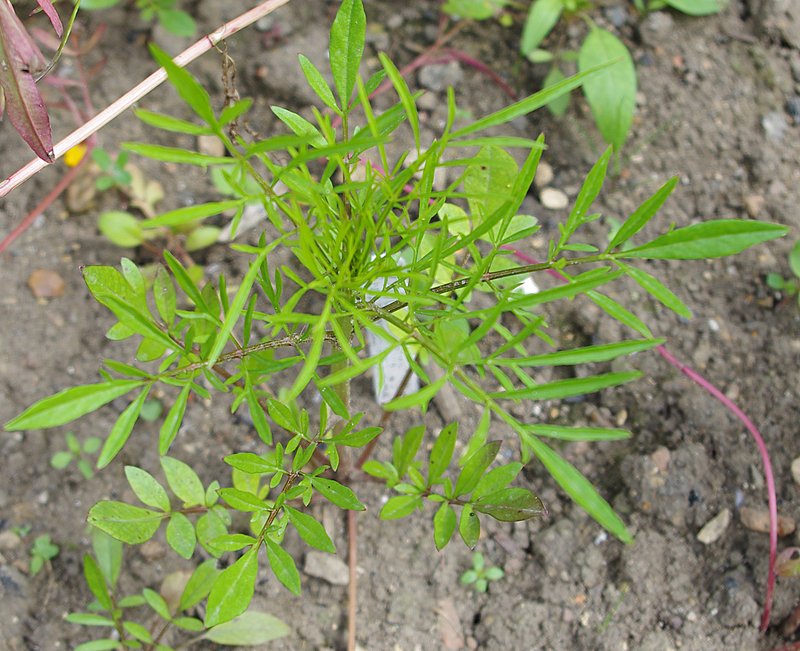 As a waterside plant Japanese indigo is used to having its roots in water and it follows that it will grow very poorly in dry well drained soils. In the summer months of June to August I have to water my plants nearly every day because I have a light chalky soil. 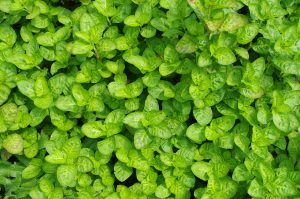 Once the plants achieve total ground cover they act as a shade and help keep the soil damp but they still need water on a regular basis. Take the first cut about 8 inches above ground leaving plenty of leaves on the plant. In experiments growing some Japanese indigo amongst other plants. I was surprised how well it responded to the competition, growing taller and greener. In a good year it is possible to take two or even three harvests of the plant. The stems are cut about 6 to 8 inches above the ground and the plants soon grow back. 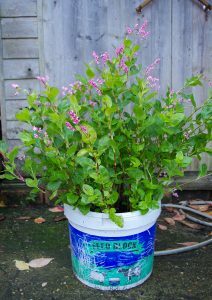 For an added boost to your harvest once you have stripped the leaves off the stems the now leafless stems can be placed in buckets of water with a dollop of liquid fertilizer and they will grow quickly back. The stems alone have no indigo content. Stems of Japanese indigo after leaves have all been stripped off. 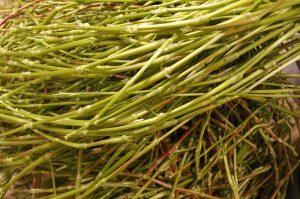 The stripped stalks when placed in buckets of water with added liquid fertilizer will rapidly regrow and provide you with an extra harvest. Growing in a greenhouse it was possible to plant the seedlings out earlier but even then a mild frost in early May damaged and killed some of the plants. 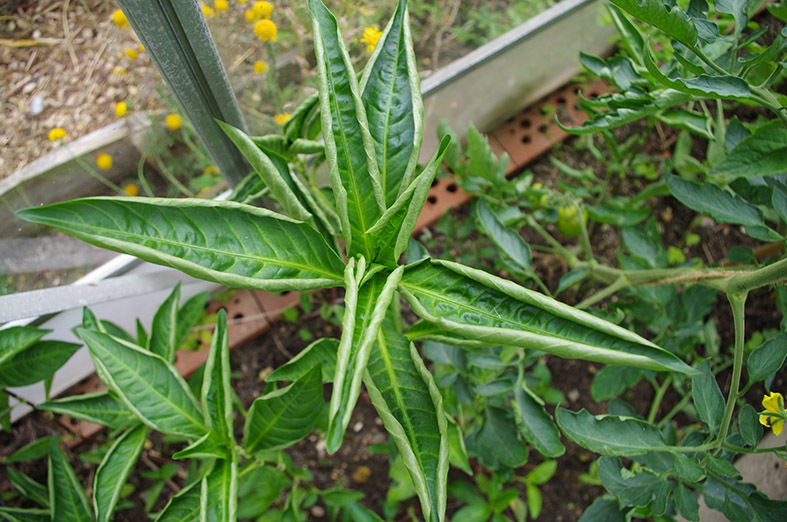 Frost damaged seedling in the greenhouse in May 2016. Japanese indigo does not need to be grown in a greenhouse or polytunnel unless you live far to the north but it clearly prefers being indoors growing lushly with greener, larger leaves and does not produce flowers until later so has a longer season. Japanese indigo needs a long growing season to flower and usually only comes into full flower in October. It is self-fertile so will produce seed in a sealed greenhouse but will flower sooner outside in full sun. However, If frosts or bad weather are forecast before the seed has set be ready to dig a few up and transfer to greenhouse or poly-tunnel or bring indoors in pots. 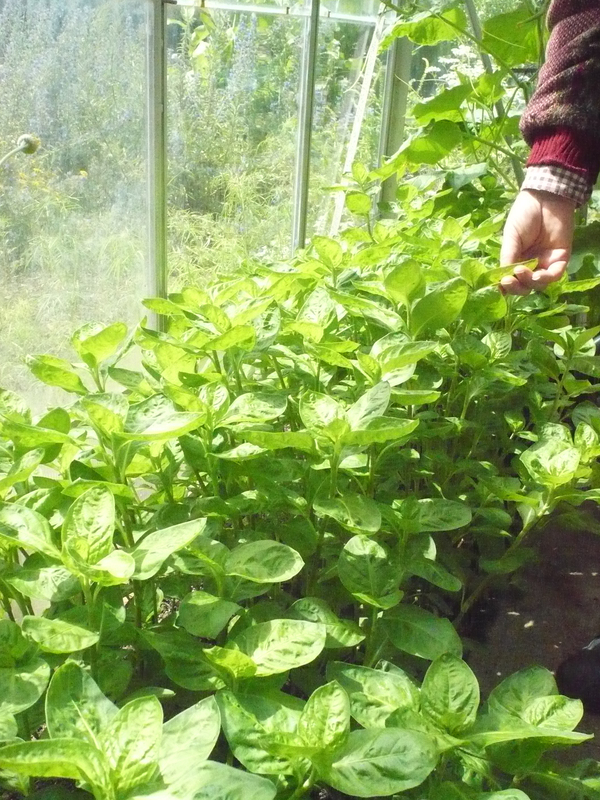 In the North it may be best to grow Japanese Indigo in a greenhouse or poly-tunnel. But because it flowers later it may not be possible to get seed unless the greenhouse is heated. 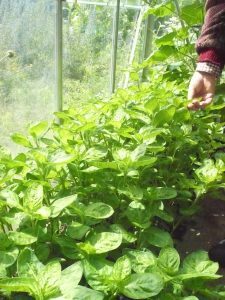 Some growers have reported that it is possible to get plants through the winter by bringing them into a well-lit and warm area where they will flower early the following year and produce seed. The different varieties of indigo respond differently to greenhouse growth as the photo below shows. This particular variety flowered at much the same time in or out of the greenhouse. The leaf curl may be a response to the extra heat. The long leaved variety growing in the greenhouse with curled leaves. There are always a few plants that come into flower before the rest and it is best to leave these alone when you harvest. A few years ago I began an experiment to try and breed a variety of early flowering plants so I could be sure of getting some seed even in a bad year. This went according to plan and I ended up with plants that flowered in early September and some in August. 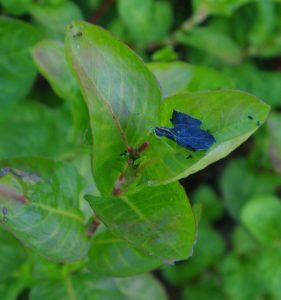 However, once the plants start to flower the amount of indigo in the leaves starts to reduce and in full flower the yield is very poor. This led to lower harvests overall. Another strategy you can use for getting seed is to grow a few plants in a dry bed only giving them enough water to keep them alive. These plants will become stressed and will flower earlier – they may look miserable but the seed will produce nice healthy plants next year. 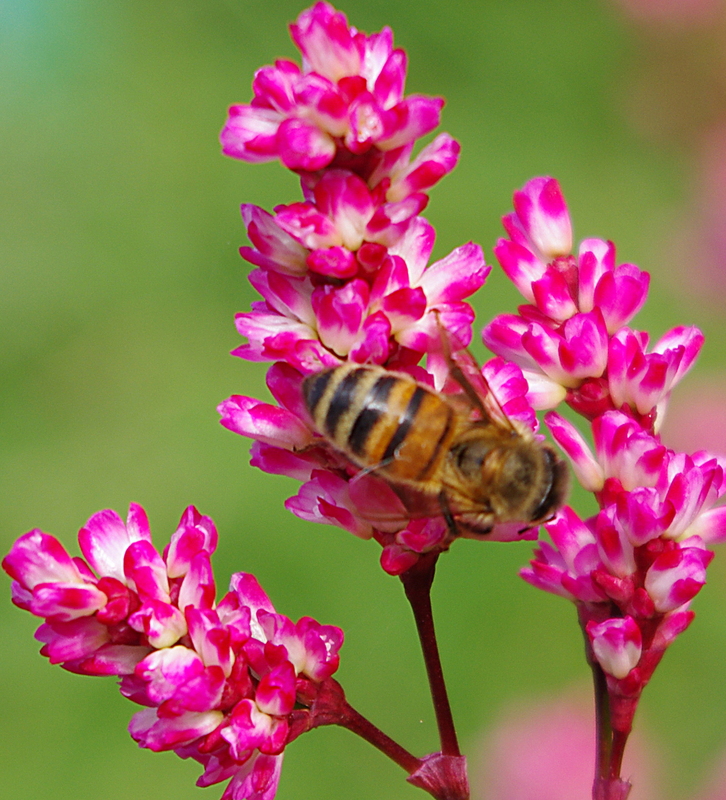 Interestingly when the plants are in full flower they are very attractive to bees particularly honey bees. I wonder if honey can be obtained from the German fields of Japanese Indigo, as is possible with the fields of Woad in Norfolk. Seeds from the flowers in the greenhouse. As bees and most pollinating insects could not get into the greenhouse it looks like the the flowers are self fertile. 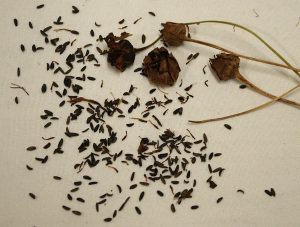 When the flowers go brown they can be cut and hung up or laid out to dry and some of the seed will fall out. The remainder can then be rubbed out. 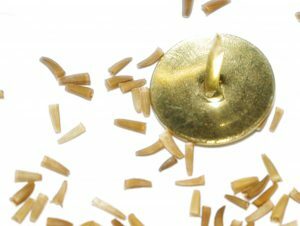 Separating the seeds from the “chaff” is a skill all by itself. Once you have removed the seeds and dried flower material from the stalks, place the whole lot in a tray and shake from side to side. All the heavy seeds will settle to the bottom and if you are careful you can blow the chaff from the top. This can be a dusty business so you must be careful not to breath it in. 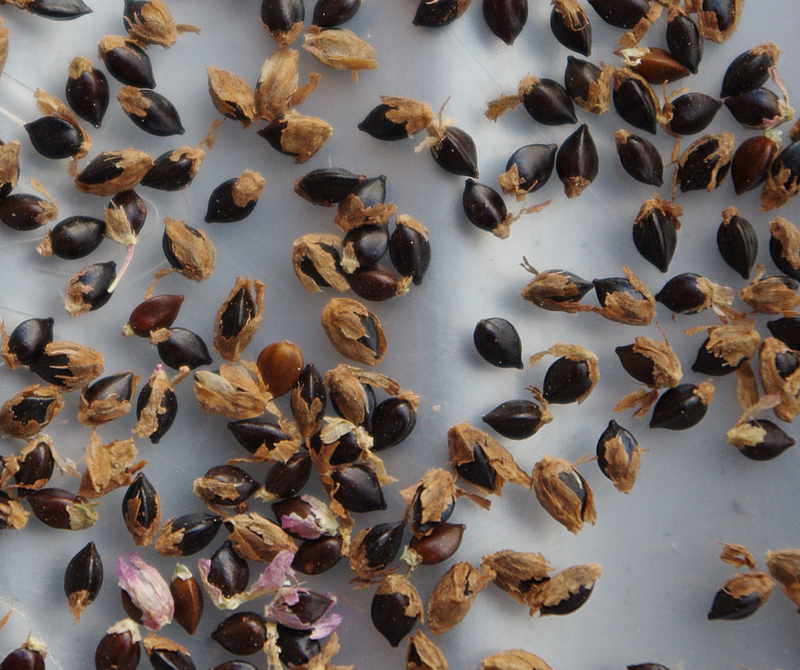 Some of the seed will retain an outer layer of brown chaff bound to the seed; this does not impair germination. Take a few handfuls of leaf and crush them up in a suitable container or blender. Add some white fibre immediately to the mix and leave for an hour. The colour obtained is rather dull and some of the colour may wash out. What remains will be fast and will give you a good indication of how good your indigo is. 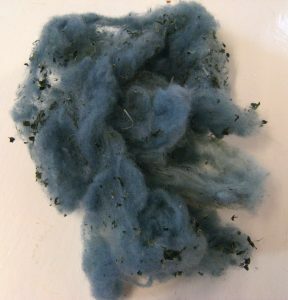 When new to dyeing with Japanese Indigo and Woad it is common to wonder how indigo was discovered as the plants apparently do not produce anything obviously blue though occasionally leaves will die and turn a dark grey or blue black. I suspect that someone observed that when crushed the fresh leaves will release indigo but it is only noticeably blue if you then add some white fiber to them. This is a good test to see if your indigo is ready to be harvested. 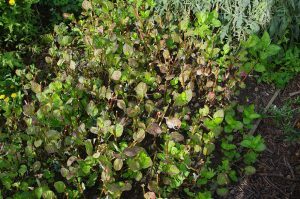 This entry was posted in Ashley's posts, Grand teint, growing dye plants, Growing Japanese Indigo, Growing Japanese Indigo article 1, japanese indigo and tagged Dyer's Knotweed, Grand teint, Growing dye plants, Indigo, Indigo dyeing, Japanese Indigo, Persicaria tinctoria, Polygonum tinctoria on 15th November 2016 by susan dye.